Called as the Red City – Al Hamra – because all its reddish buildings, Marrakesh is one of the most exciting cities in the world. To visit Marrakesh is a once on a lifetime experience. 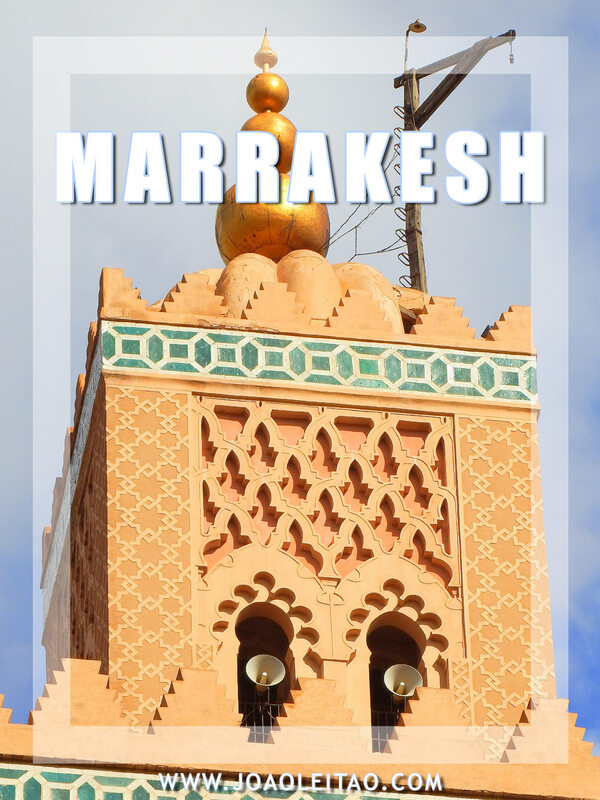 If you are looking for a 3-day Marrakesh travel guide, you came to the right place. 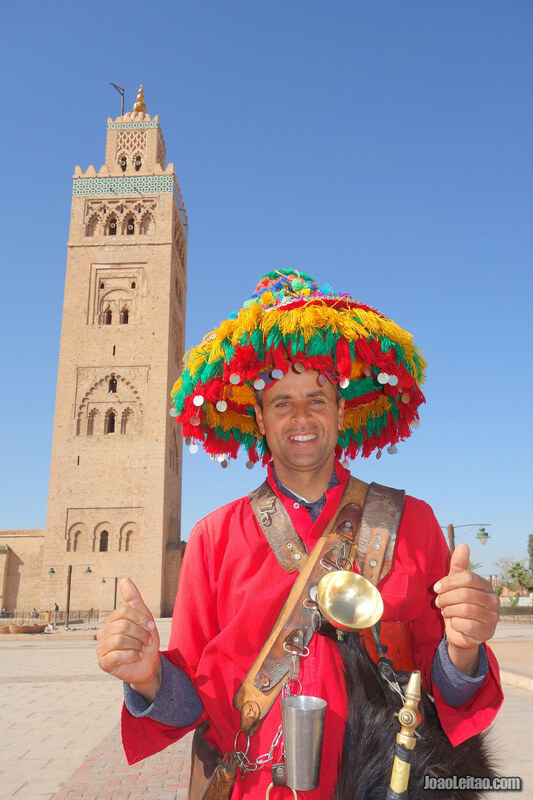 Marrakesh attracts many tourists, so it is easy to confuse its history and culture with its strong touristic aspect. 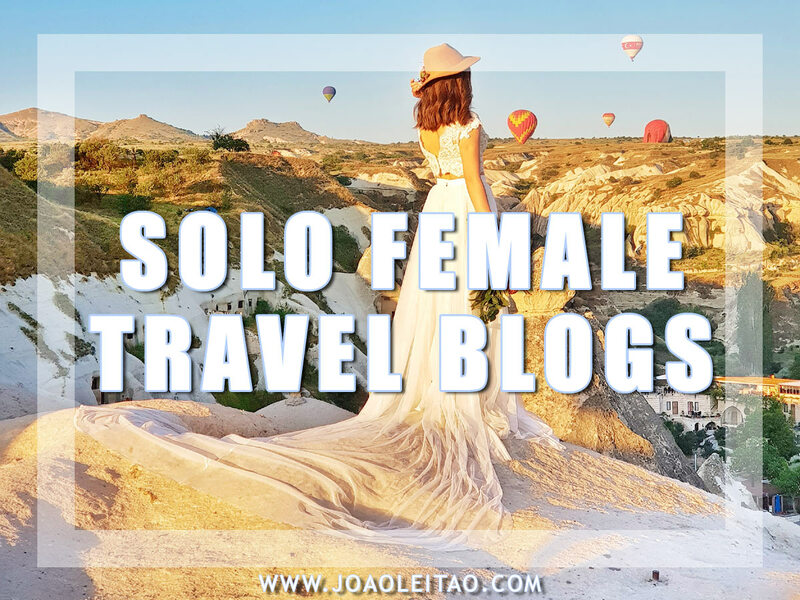 On this page, I will try to demystify this fantastic city, and compile a few great places so that when you travel to Marrakesh, you already have something organized. History books say that Marrakesh was founded in the year 1071 in the Almoravid dynasty and was the most important metropolis of North Africa for many centuries. But, we can consider that it is Ali Ben Youssef who founded Marrakesh in 1126. The first 9 km wall was created at that time along with a new palace and several administrative buildings. 300 years later, in the Saadian dynasty – in the second half of the 16th century – Marrakesh became the capital of the kingdom thanks to Abdallah al Ghalib (1557-1574). 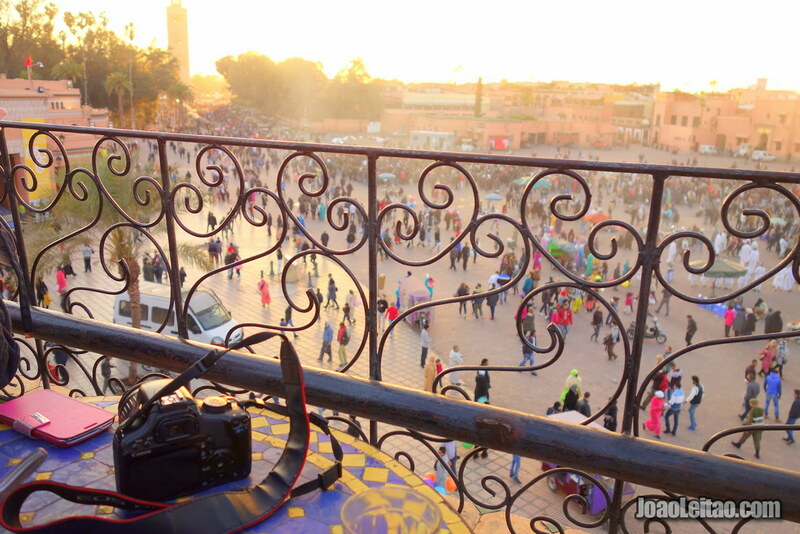 All the streets of the old medina lead to the Djemaa el Fna square. There is no more fantastically insane place in Morocco than this. 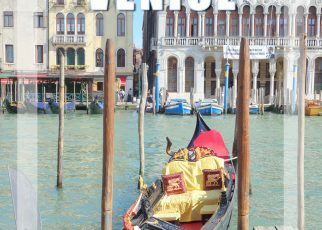 Musicians, snake charmers, monkey tamers, acrobats, and storytellers fascinate those looking for excitement on this famous square. 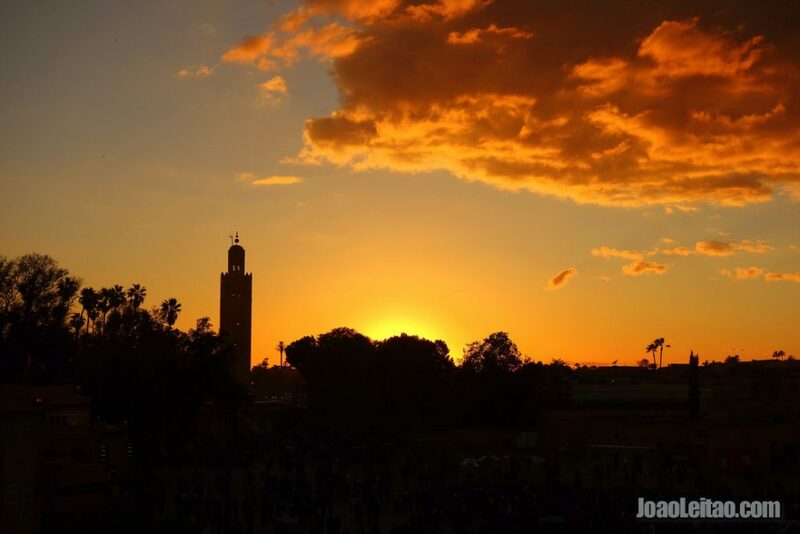 If you travel to Marrakesh and skip Djemaa El-Fna you miss the soul of the city. We explore the main square through the smoke from tea stalls and the dozens of street-restaurant grills, the mysterious lighting of the various lights lit by gas bottles, thousands of visitors, storytellers, and various street performers. The best time to visit Marrakesh is right before and right after summer, which means the months of May, September, and October. It’s too hot in the peak of summer and walking the streets for hours while exploring the city becomes uncomfortable for some visitors. And the winters, unlike most people think, can be surprisingly cold. 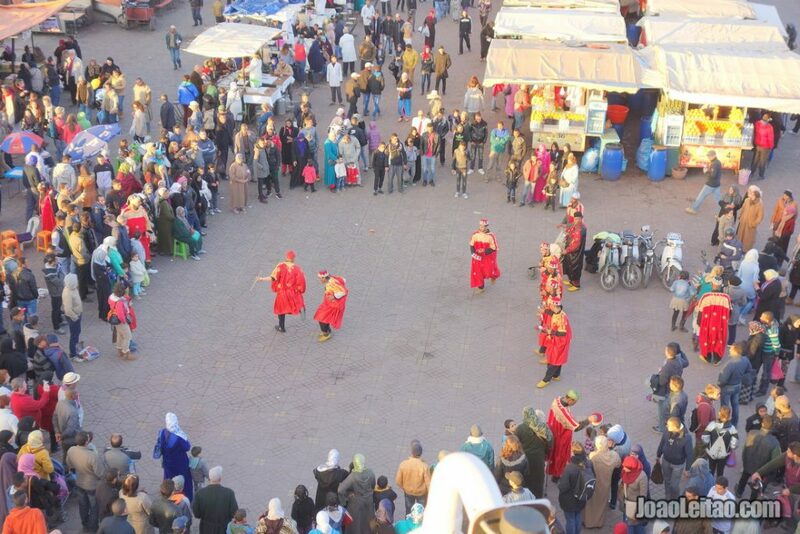 If you travel to Marrakesh in mid-July, you’ll be able to enjoy the Popular Arts Festival that fills the streets of the medina with artists of all genres, concentrated around the Jemaa el-Fna square and the El Badi Palace. Don’t miss Fantasia night, a top-rated show in Morocco reenacting battles with extras and Moroccan horsemanship. 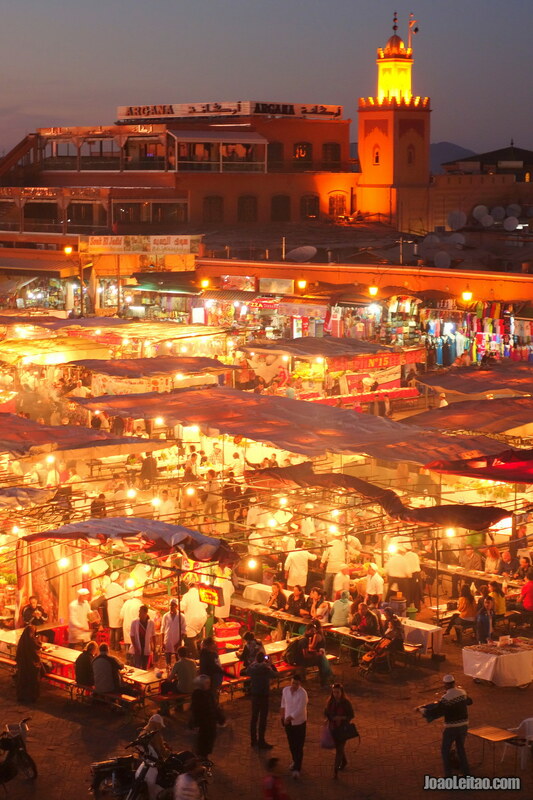 Marrakesh is a relatively safe city where 1.8 million tourists a year stay, on average, for four nights. Marrakesh has museums, the old medina, several markets (souks), the palm grove, several venues for events, tours, shops, palaces, restaurants, etc. 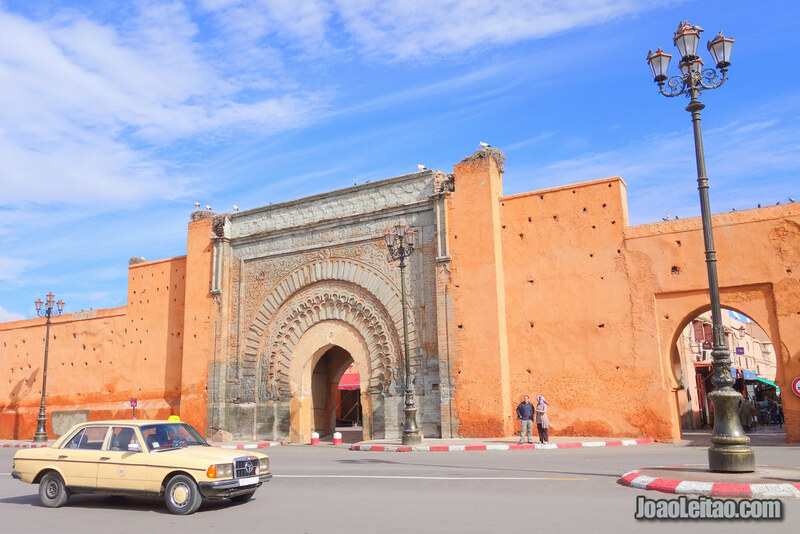 All Moroccan cities have an older part where the medinas are located. These days, they’re fascinating places for selling and buying all kinds of products, and their streets are full of shops and street vendors. 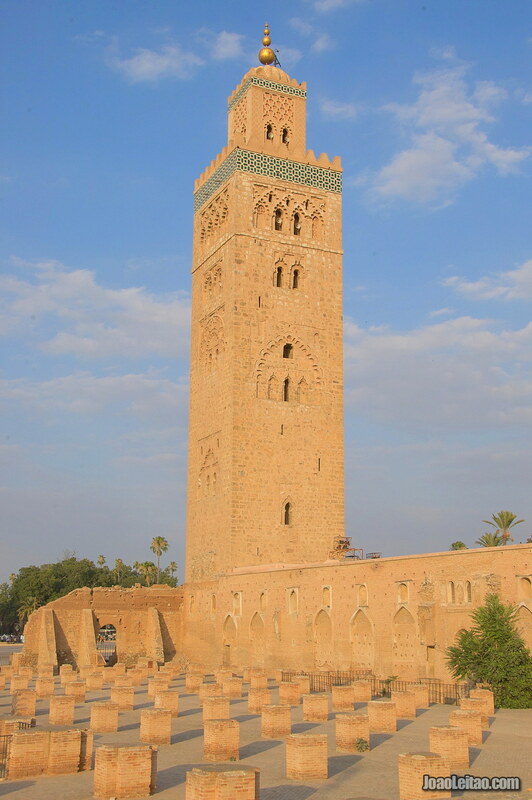 The Marrakesh medina, listed as a UNESCO World Heritage Site since 1985, was founded in 1071 by the Almoravids. They’re part of every Moroccan’s daily routine. Medinas are typically surrounded by fortified walls to protect the city from invading attackers. 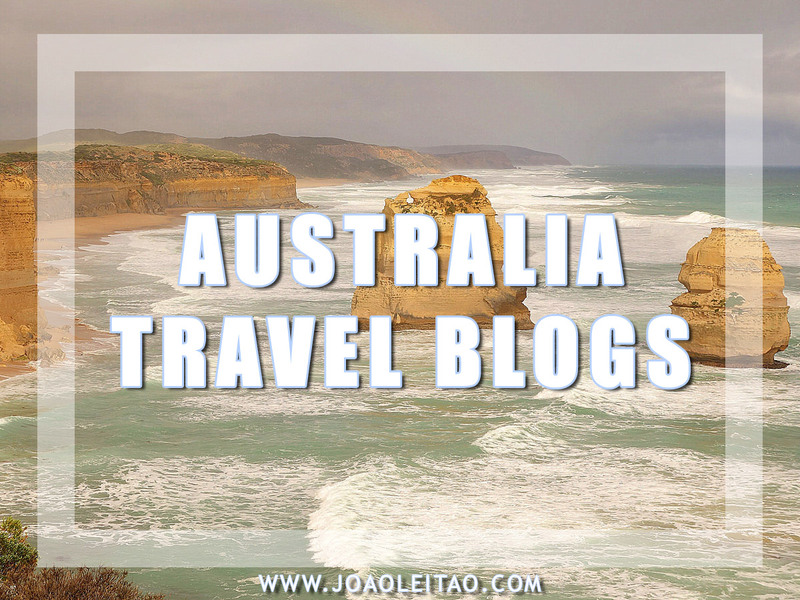 In addition to being a prominent place, culturally and historically, it’s a worldwide known tourist attraction. 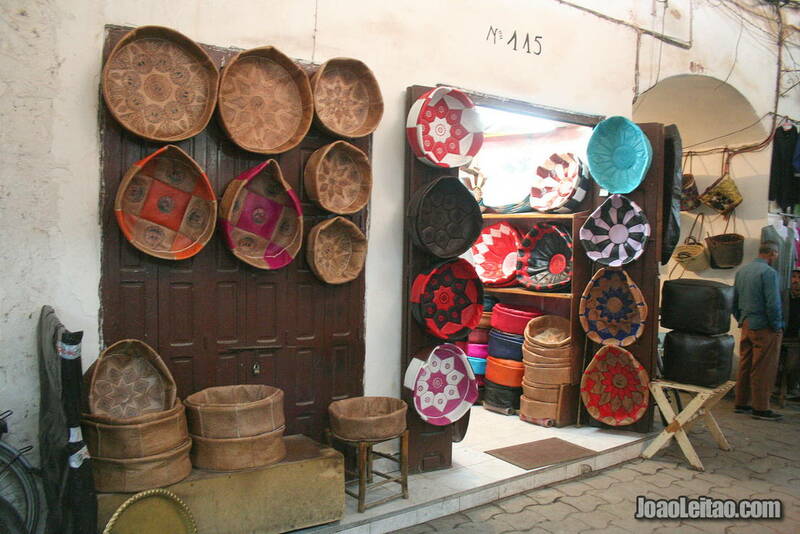 Here you’ll find one of the biggest Souks (traditional markets) in Morocco where you’ll find all sorts of products for sale. 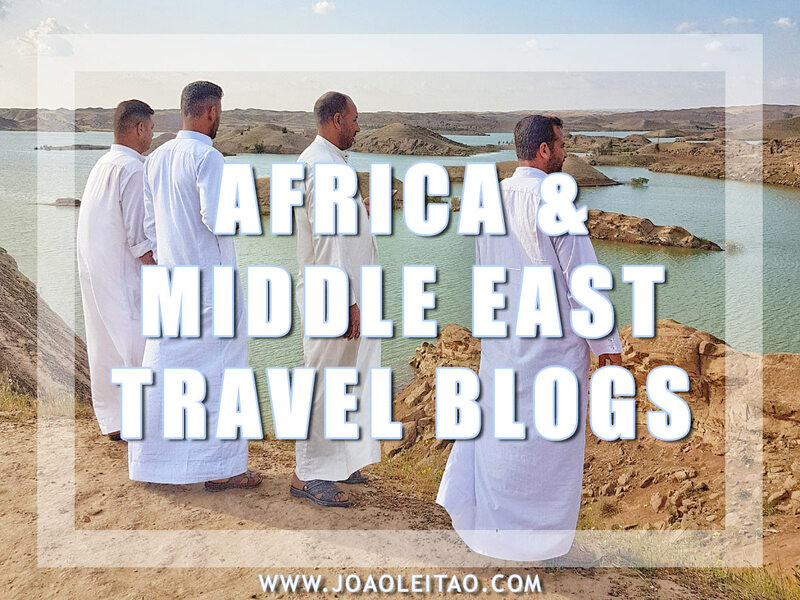 In this medina you’ll see some of the most important historical monuments and landmarks like the Koutoubia mosque, the Kasbah, several magnificent gardens, sculpted doors, the Ben Yousef Madrasa, the Bahia Palace, the Jemaa El-Fna square, the Saadian Tombs, and the enormous 19th century manors (architecturally classified as Hispanic-Moorish style). Visit the Majorelle Garden first thing in the morning. It’s nice and cool in the morning, and it’s best enjoyed when there are fewer tourists around. It opens at 8:00 a.m. and, if you’re an early riser, it’s a win-win situation. 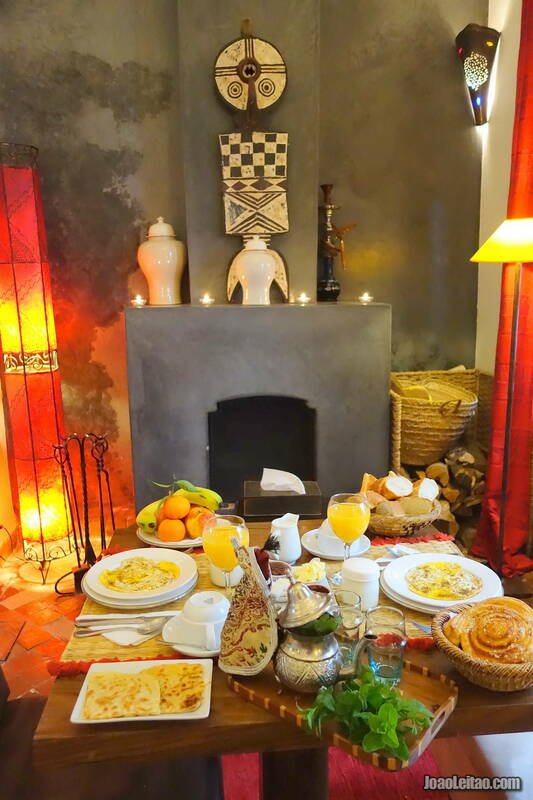 Have breakfast and go out to explore Marrakesh! Majorelle Garden is about 500 meters from the medina, behind the central bus station. You could take a taxi, but it’s not necessary. It’s a pleasant walk, especially in the early morning. Once you reach, you can then choose to visit just the museum or, if you’d like, include a visit to the Berber Museum too. Admission fee is 70 Dirham, but you’ll have to pay an extra 30 Dirham to visit the museum exhibition. 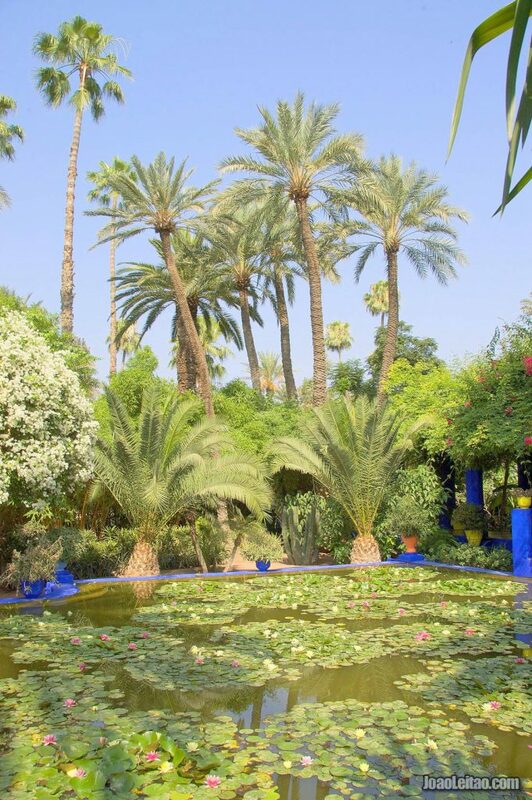 The Garden was designed by Jacques Majorelle (1886-1962), a French artist who lived there, a cubist house designed by architect Paul Sinoir in the 1930s. 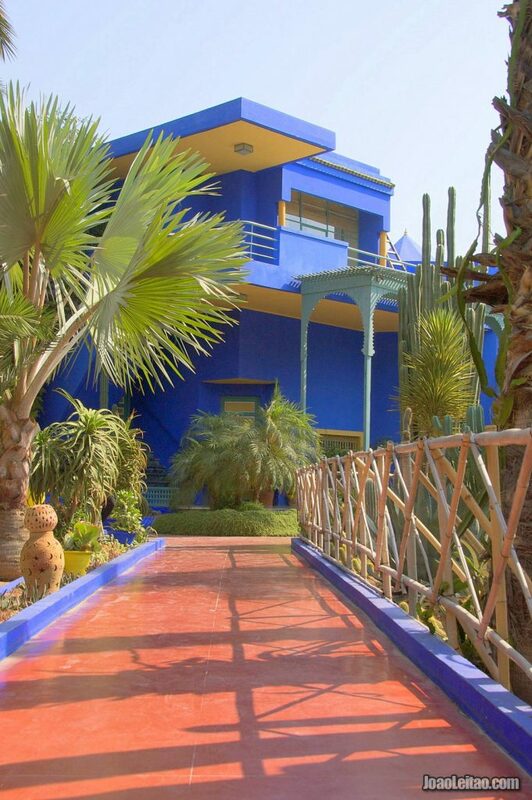 In 1980, Yves Saint-Laurent (when he passed away, Yves’ ashes were scattered at Majorelle Garden at his request) and Pierre Bergé bought the property from the heirs, restored it, and opened it to the public. It’s a charming place, with a splendid collection of cactus, exotic plants and trees, grouped magnificently to create a sense of consistency. It’s complete with palm trees, a lily pond, and a small bamboo forest. A water fountain and a canal envelop the garden with the sounds of flowing water, emphasizing the place’s serenity. Later, you can visit the museum on the first floor with over 600 artifacts and pieces from the Berber culture. From the Majorelle Garden you will go to the Koutoubia Mosque, around 2 km walking distance. It’s up to you if you risk walking or you’d prefer to catch a petit taxi. If you choose to walk, you can take a detour to Cyber Park in the middle of your way there. 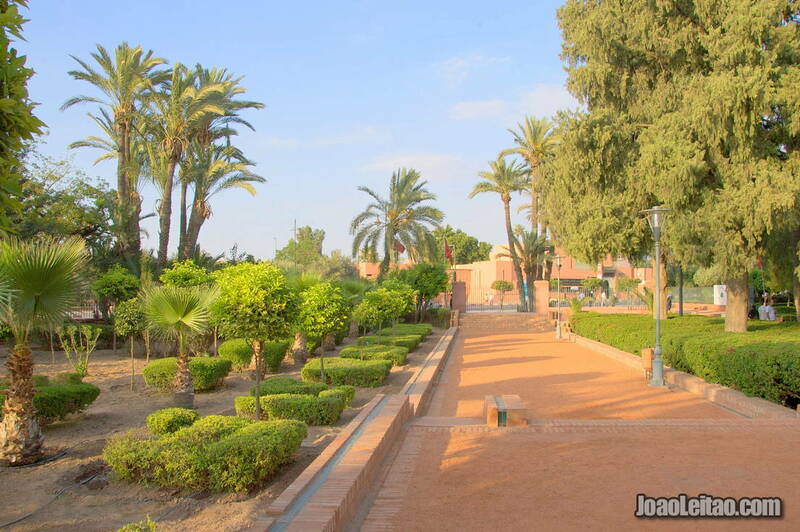 Despite the contemporary name, this park goes back to the 18th century, built by Prince Moulay Abdessalam, a remarkable poet, writer, academic, and diplomat. In 1920, under French ruling, the park was expanded but then neglected in the following decades. In 2005 it was renovated and equipped with kiosks with Internet access. There’s a small, free admission Telecommunications Museum by the entrance, covering the History of telecommunication in Morocco from the first telephone installed in Tangier in 1883. Koutoubia is the largest mosque in Marrakesh, initially built in the mid-12th century where there used to be another temple from the previous century. To this day, it’s still the tallest building in the city, with its 77-meter-tall minaret. That is, by far, the most relevant part of the mosque, that influenced the style of other minarets across the country: tiles and pointy grooves on top, and irregular décor patterns. Unfortunately, only Muslims are allowed inside mosques in Morocco. If you’re from a different religion, you’ll have to admire Koutoubia from the outside. If you enjoyed this site, return after sunset when the light bouncing off the mosque is genuinely spectacular. There’s a public garden right behind Koutobia called Parc Lalla Hasna, from where you have the best angle to photograph the mosque and the minaret. Right next to it, across Avenue Hommane Al Fatouaki, there’s a big wall painted in an orange hue that protects La Mamounia Hotel. The room price of 400 Euros a night doesn’t suit all travelers, but it’s possible to visit the most historic and famous hotel in Marrakesh. Opened since 1923, some of its most famous guests include Nelson Mandela, the Clintons, the Rolling Stones, Charlie Chaplin, George Orwell, Omar Sharif, Charlton Heston, Sean Connery, Catherine Deneuve, Sharon Stone, Sylvester Stallone, Will Smith, Sarah Jessica Parker, Tom Cruise and Nicole Kidman, and the Reagans. In 1943, in the middle of World War II, some of the most important world leaders of that time stayed here: the president of the United States of America Franklin Roosevelt, General De Gaulle (so tall that forced the hotel management to order a custom-made bed), and United Kingdom Prime Minister Winston Churchill. Of all these public figures, Churchill was the one with the strongest bonds to Marrakesh and La Mamounia. He came for the first time in 1935 and, until his passing in 1965, he returned countless times and even worked on some of his paintings here. One of his most famous pieces is a painting of the medina and the Koutoubia mosque that he gifted to his friend Roosevelt. This was probably the only painting Churchill did during the war and was recently valued at three million dollars. 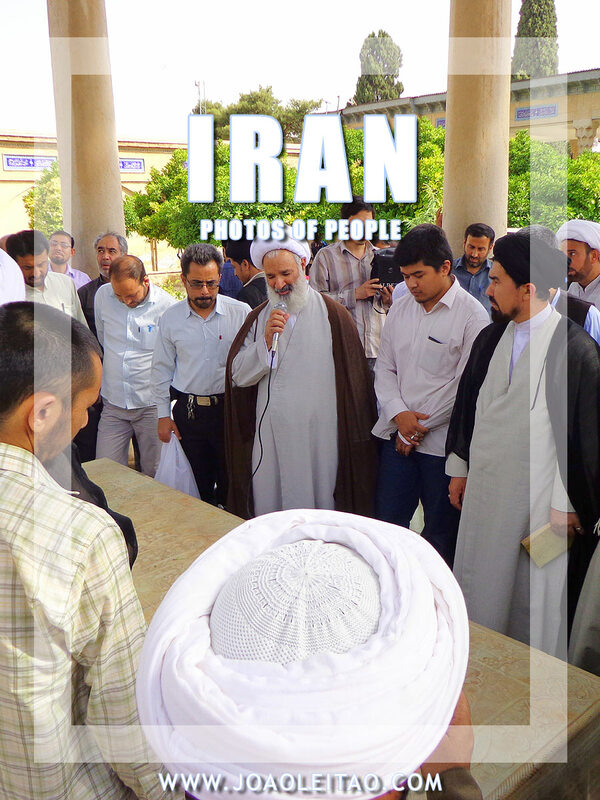 If you enjoy touring cemeteries, visit the Cimetiere Imam Souhaili right behind the hotel, connected to a hospital. It’s not an extraordinary site, but it’s good for you to have an idea of the differences between a Muslim and a Christian cemetery. 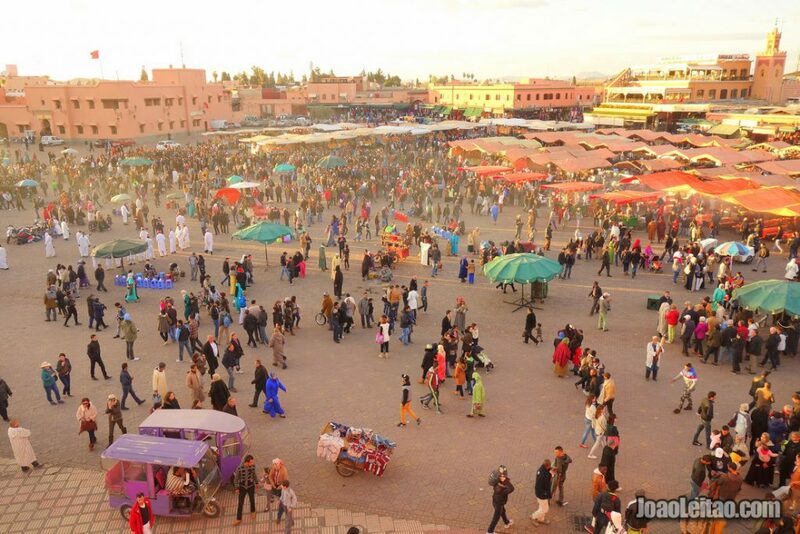 It’s time to get to know the famous Jemaa el-Fna square, the heart of the medina and Marrakesh. The square is like a small universe overflowing with energy and events almost 24/7. This was the place where in the 11th century when Marrakesh was founded, they executed prisoners sentenced to death. Nowadays, everything happens here. Street performers arrive in the morning, bringing the square to life: snake charmers, storytellers, monkey trainers. Women make henna tattoos, there are improvised boxing matches, dancers in drag and jugglers. Music comes out of exotic instruments and men wearing traditional clothes sell water in the streets. What they’re actually selling is having their picture taken with tourists. The square is surrounded by restaurants, cafes, and different stores catering to tourists. You can choose any of these places for a relaxed lunch while people-watching. Some have terraces with great views of the square. 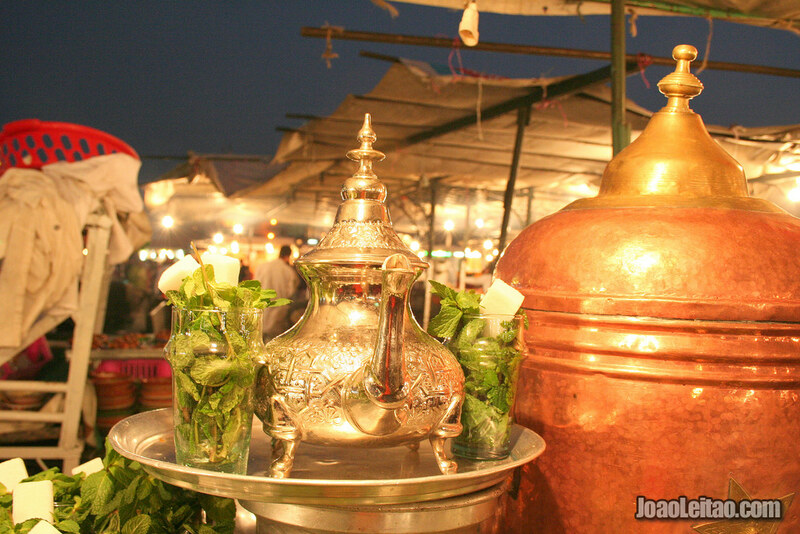 Order mint tea after enjoying a delicious typical Moroccan meal, like a chicken or vegetable tagine, couscous, or pastille. After you’re done, walk into the square and stay for as long as you can to take it all in. It’s impossible not to be mesmerized by the countless shows happening at the same time, but don’t let your guard down because pick pocketers are all around you in the square and the streets around it. There are plenty of tourism police officers around, so you’ll have someone to go to in case something happens. In the meantime, you can return to your hotel for a while, recharge, have a shower, and get ready for the evening at Jemaa el-Fna square. After 6 p.m. the square begins to get crowded with people coming for dinner, and it peaks between 9 and 10. When the sun sets, the light in the square is amazing. By that time, what was once an empty ground will be full of restaurants — rows of improvised tents, filled with tables ready for dining customers. The businesses at night are grouped by theme. There’s a row of tents selling a unique combination of products: ginseng tea with a secret mix of spices that turn the drink into a potion-like beverage, pieces of a very dark brown cake made with sesame and almonds. As for full meals, you’ll find mobile restaurants also concentrated in a specific area. Just follow your gut and choose your favorite. If you still have room for more after dinner, drink a glass of freshly squeezed orange juice. There are dozens of tents selling them. 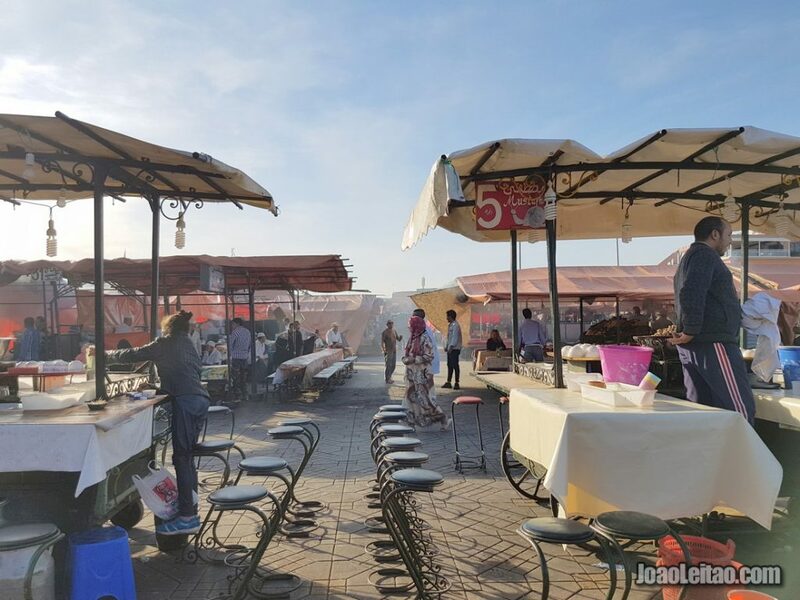 Rest assured that, as you walk back to your hotel, you’ll return to Jemaa el-Fna square many more times for as long as you stay in the city. Let’s start the day on the south side of the medina, looking for the El Badi Palace. It opens at 8:45 a.m., and tickets cost 10 Dirham. Construction began in 1578 and ended in 1593. In 1578, Portugal partly and temporaliry lost its independence after King Sebastião disappeared in the battle of Alcacer-Quibir. This palace was built with ransom money that the Moors got from the families of the Portuguese noblemen kept prisoners. However, the palace wouldn’t stand for long because it was built by the Saadi dynasty that declined years later. 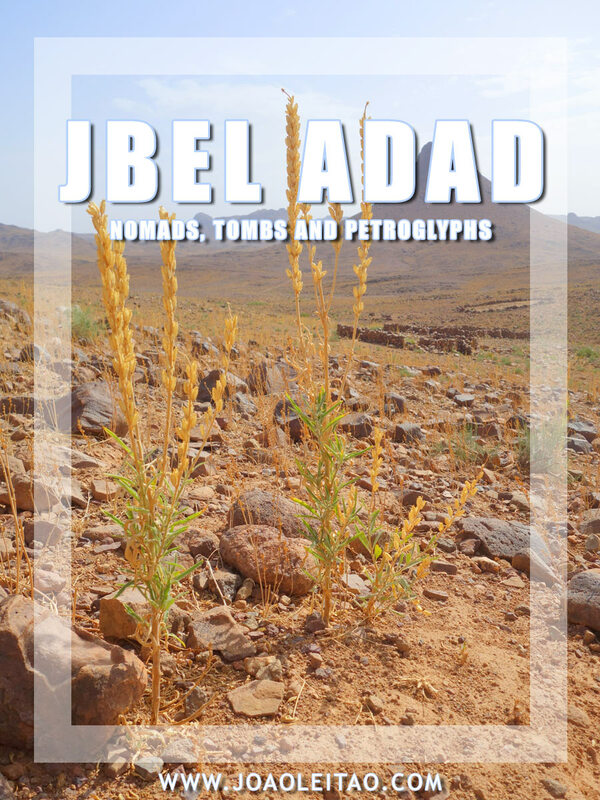 When Sultan Ismail Ibn Sharif conquered the city in 1677, he had no interest in El Badi, and he stripped the palace of all riches and construction materials that he used elsewhere, especially in Meknes founded at the same time. History records claim the original palace had 360 rooms and was built with the finest materials of that time, including gold from Sudan, marble bought from Italian merchants in exchange for sugar, and other high-quality materials like ivory, cedarwood, and precious stones. The palace never recovered from the 1677 pillage and stood until present time as a cherished ruin. There’s an interesting atmosphere to it, especially early in the morning when there are fewer tourists around. 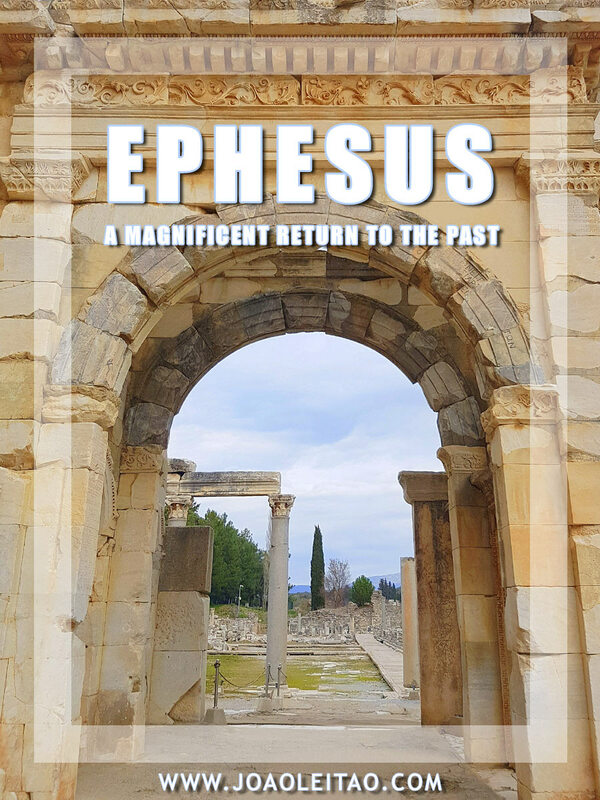 Must-sees include the dungeons and the four cells you can visit after going through a dark tunnel, and the sunken garden where you can see the remains of the apartments, where foreign leaders would stay when visiting the local ruler, and the beautiful mosaic floors. Considered a sacred animal, storks are all over the El Badi Palace where you can see some of their nests. Right next to El Badi Palace, but in much better shape, is Bahia Palace built in the 19th century. It’s open from 8 a.m. to 5 p.m. and the admission ticket costs 10 Dirham (around 1 Euro). 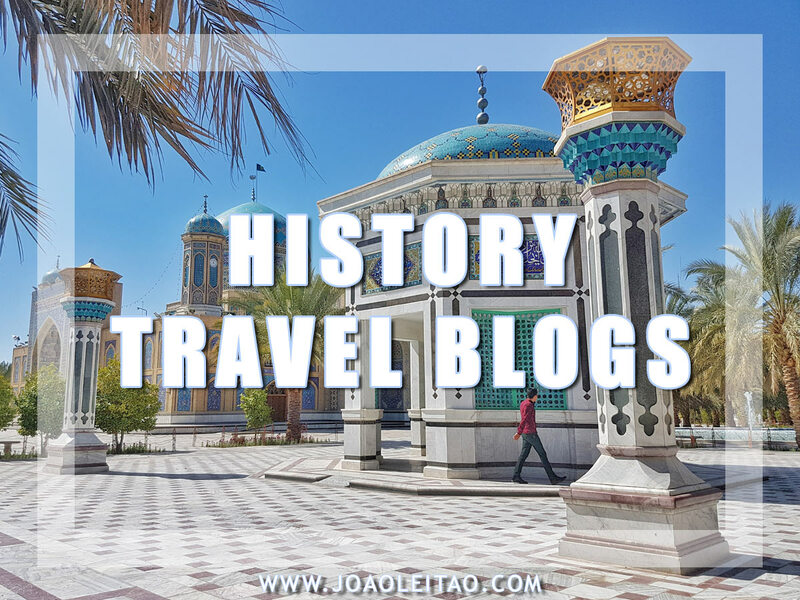 This was a very ambitious project because the owner Grand Vizier Si Moussa wanted the palace to be the wealthiest looking building of its time, hence the name Bahia that means brightness. By 1908, the palace had already had two different owners. Vizier Abu Bou Ahmed was the first, a former black slave that climbed the status ladder and had replaced the original owner. The second owner was Pasha Glaoui, who used the palace to host his French guests. The Europeans must have loved the place considering that in 1911 when Morocco became a French Protectorate, they used the palace as the official residence of their representative in the territory. Please note that only a small part of the palace’s 150 rooms and 8,000 square meter gardens are open to the public. Unfortunately, all rooms are empty now. The visit concentrates around the small and the big riad. 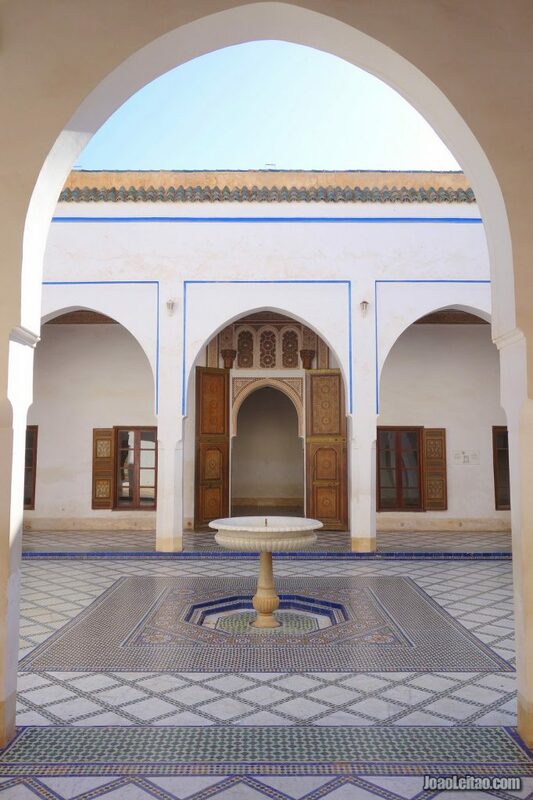 It starts at a courtyard with arches that leads into the smaller riad, a room that was added when Abu Bou Ahmed owned the palace. Here you’ll notice the work in stucco and cedar wood. Frescoes decorate the ceiling at the Council Hall. 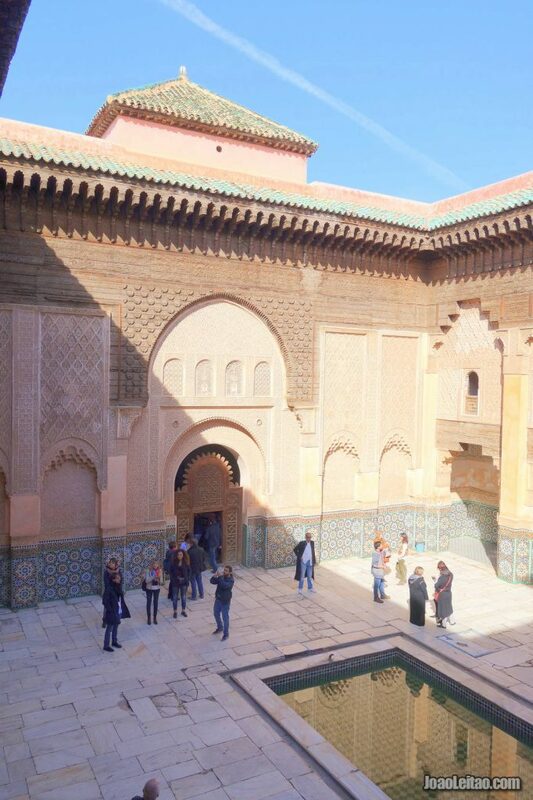 Next, you’ll walk into another courtyard that leads to the big riad, with equally ornate ceilings and walls. 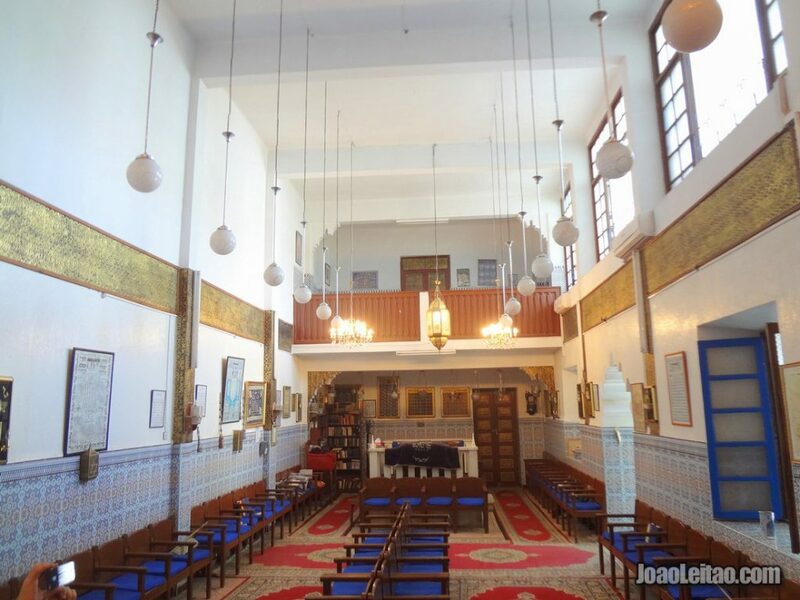 You’ll end the tour after walking through the apartment of Abu Bou Ahmed’s wife, Lalla Zinab, added to the building in 1898. The visit to the cemetery is supposed to be free, but it’s expected you give the keeper a tip. 10 Dirham should be more than enough. Next, you have the option to visit the Jewish cemetery but pay close attention to the maps because it’s not easy to find the site, located south of the Bahia Palace. 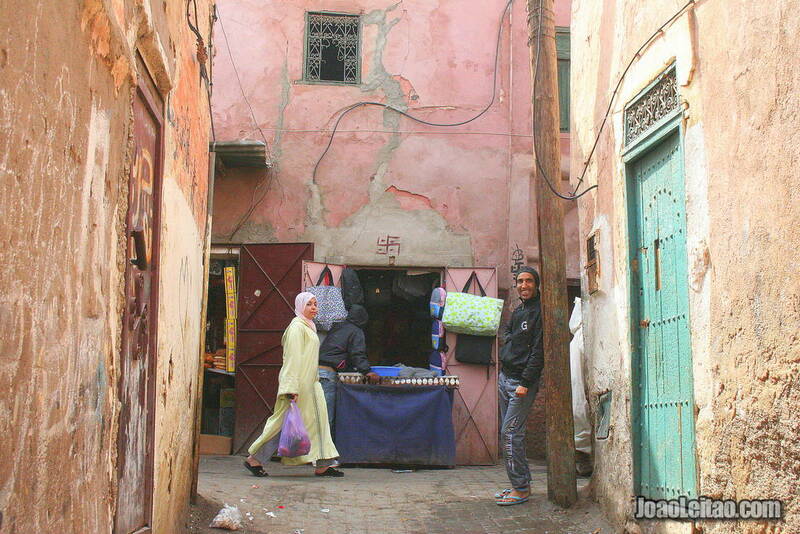 It’s an excellent first introduction to the Mellah (the Jewish neighborhood) of Marrakesh. This cemetery is a quiet place, off the beaten path for most tourists visiting Marrakesh, and it might even be closed when you reach. It depends on how busy the two brothers in charge of maintenance are. 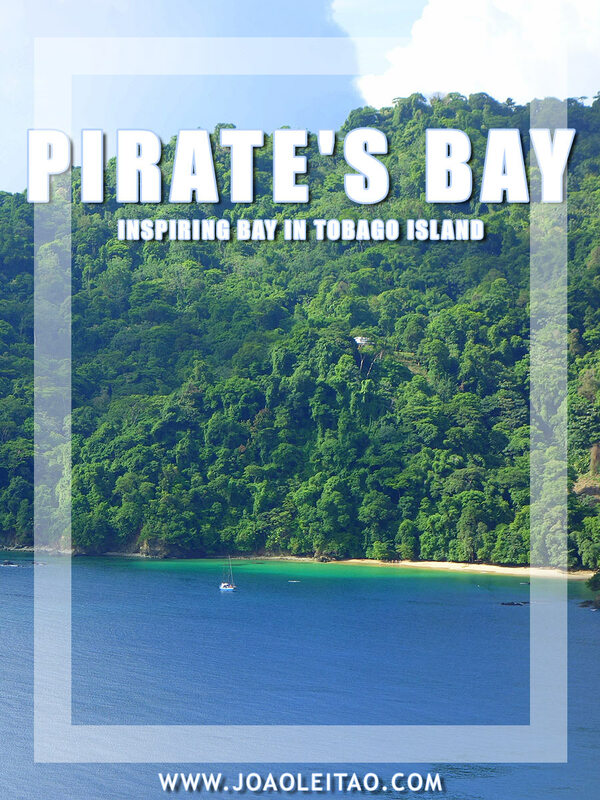 If it’s on a Saturday, you’ll definitely won’t have a chance to visit. If you speak French, you might be given some precious information about the cemetery. They’re very friendly, and they know a lot of stories. Remember that men should cover their heads when visiting a Jewish cemetery. If you don’t have something to cover your head with, just ask the keeper if he can get you a Jewish kippah. The Miara cemetery was first used in the 16th century when 30,000 Jewish people lived in the Mellah. 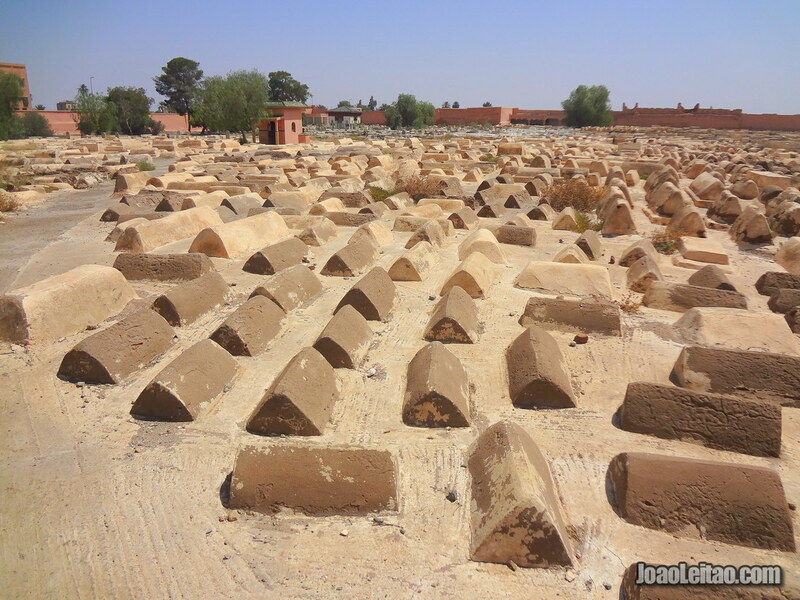 Despite its considerable size – it’s the largest Jewish cemetery in Morocco – the high demand led to the building of three overlapping layers of graves. Mellah, called Hay Hessalam, has few truly Jewish residents. It should have around 3,000 people now, a tenth of the population 600 years ago. Most left to Israel after the Hebrew State was created in 1948. It’s one of the most impoverished areas in Marrakesh and rarely visited by tourists. 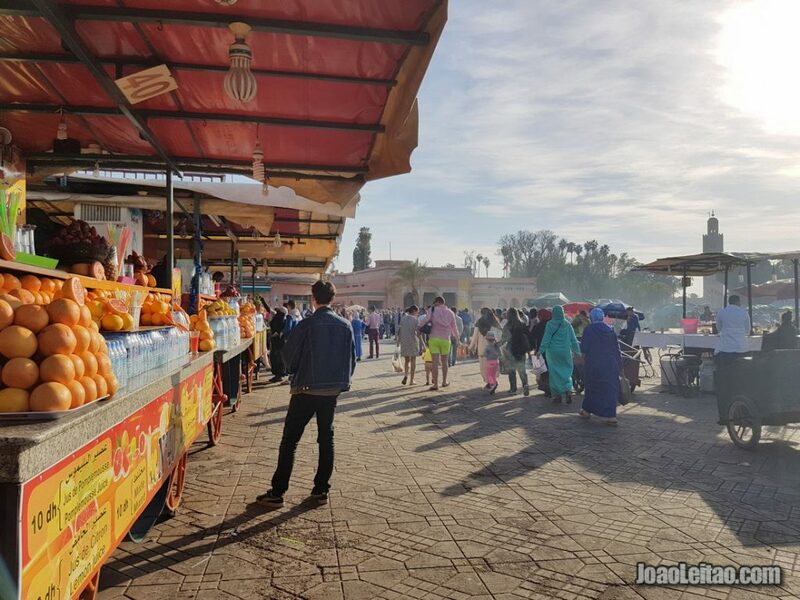 The best way to explore it is wandering freely through its streets where you can find a more authentic Marrakesh, despite recent requalification projects that may have jeopardized the neighborhood’s typical atmosphere. 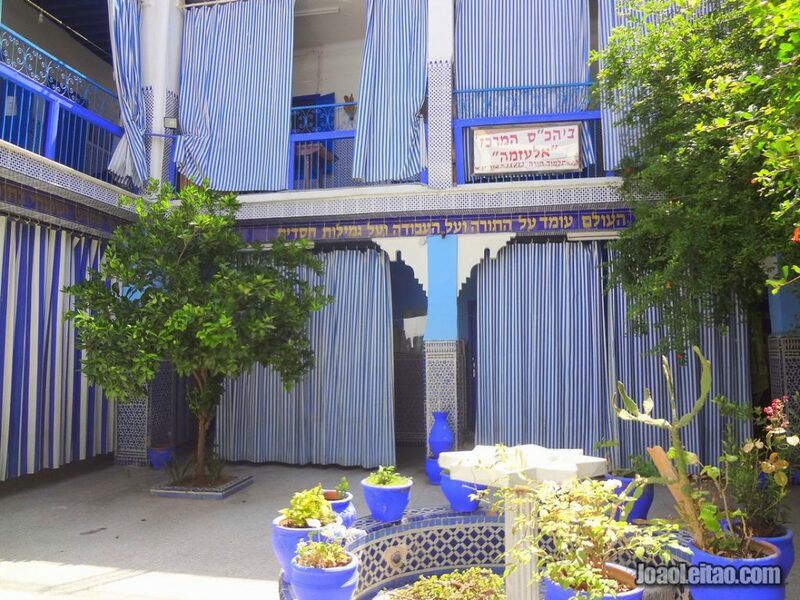 The Mellah was initially built to protect the Jewish population, but as time passed, they became ghettos, housing more people than they could, closing at night, and a mandatory place to live for all Jews. I recommend a tour of the Mellah’s covered market, perhaps the best in the city, where you can find all fresh produce to cook a meal, from vegetables and fruits to meat and fish. 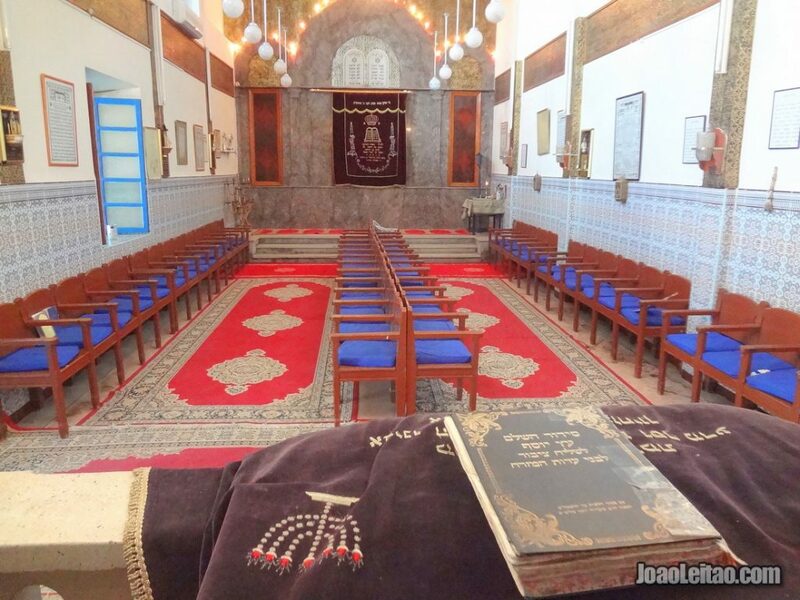 There are some synagogues throughout the neighborhood such as the Lazama, El Fasiines, Rabbi Pinhas or Bitoun. However, Lazama is the main one and the only one that’s always open to the public. It’s a little hard to find, in a street without any signs. The original synagogue was built in 1492 and the one you’ll see today was built in the early 20th century. 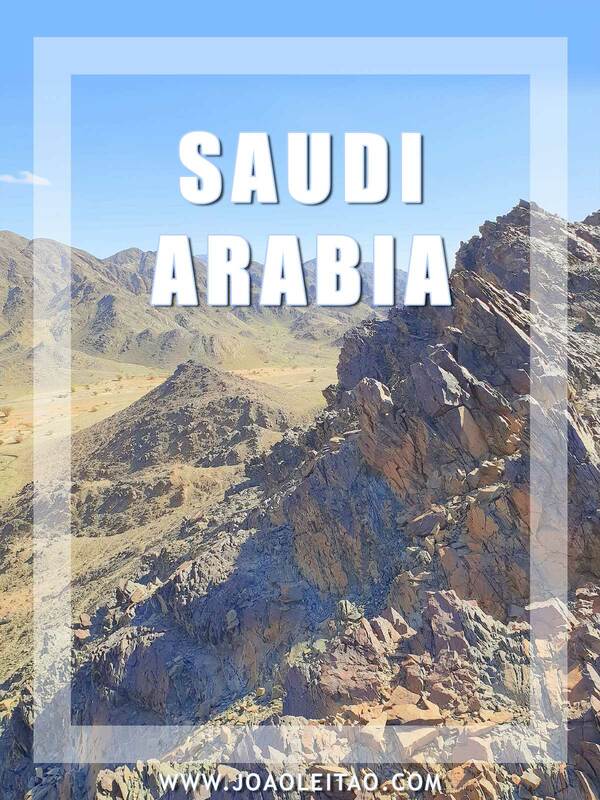 It’s open every day, and the admission fee is 20 Dirham. It’s time to go back to the center of the medina. To do so, you can walk to Riad Zitoun el Jdid street, to the east of Riad Zitoum Lakdim street, that takes you straight to the Jemaa el-Fna square. Take the second right to Rue de la Bahia, and you’ll find the Tiskiwin Museum on the right side. 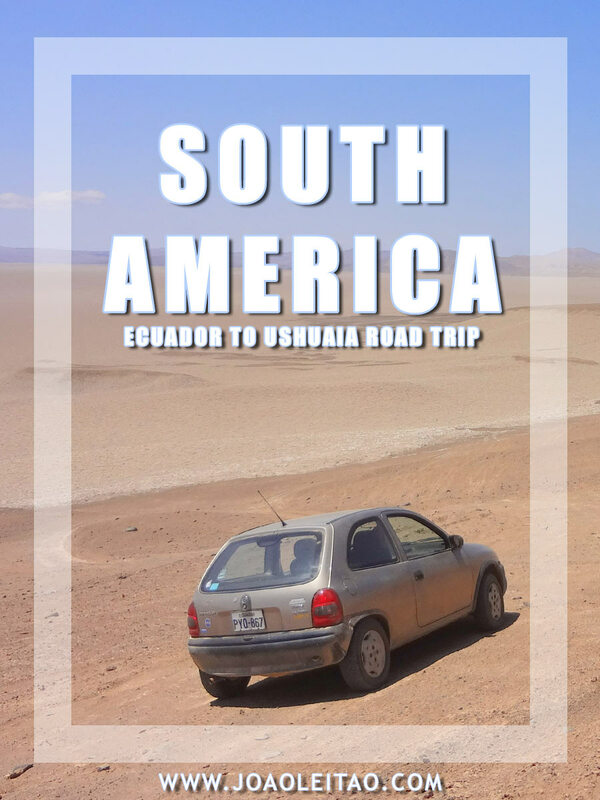 It’s a fascinating and magical place that takes you on a trip back in time. Here you’ll see Bert Flint’s collection, a Dutch anthropologist who moved to Marrakesh in the mid 20th century. 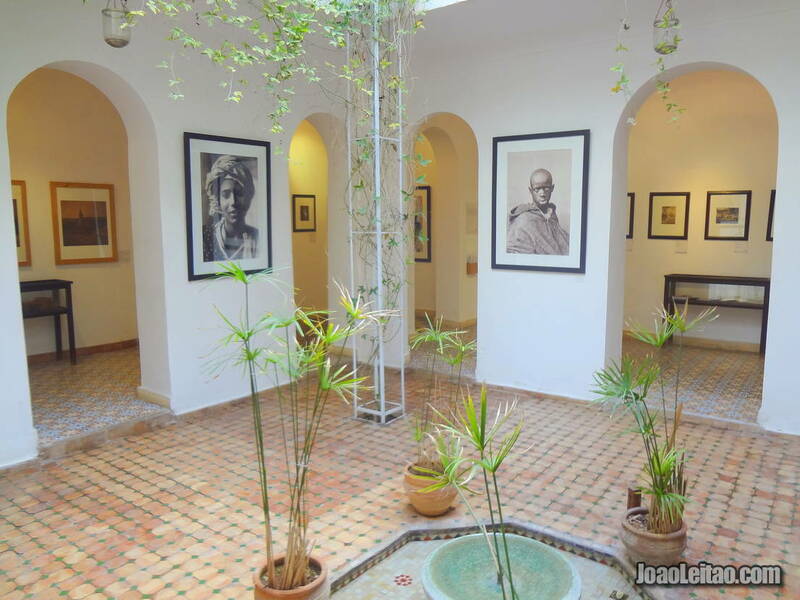 The museum is located inside a beautiful riad that’s also worthy of the tourist’s attention. The exhibition might feel old fashioned, but that’s what gives it its unique charm. It’s a place to let the imagination run free, as you explore each one of the ten rooms. Each room is dedicated to a stage of a big caravan route, taking the visitor on a trip not just through Morocco, but also Algeria, Mauritania, Niger, Senegal, and Mali. Despite the well-thought romantic concept of the exhibition, there’s an interesting fact. The anthropologist bought about 90% of the pieces on display in the streets of Marrakesh. 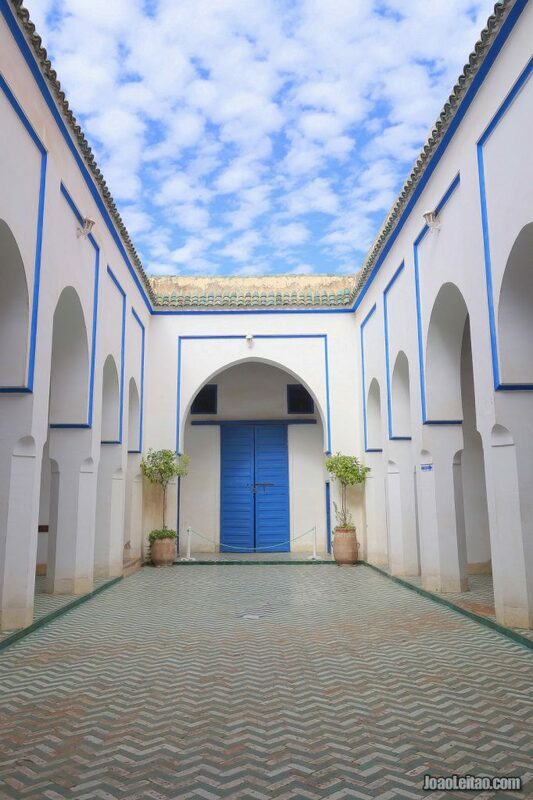 If you’re in the mood to visit one more museum, turn right on the way out of the Tiskwin and take the first street on the left, where you’ll find the Morocco Folklore Museum, also known as Dar Si Said Museum. 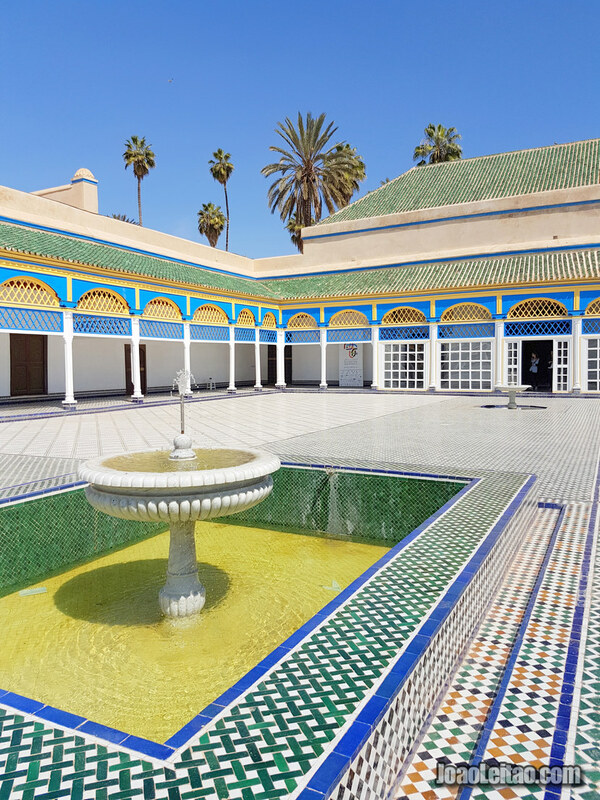 Open every day and with an admission fee of 20 Dirham, the museum is located inside a luxurious palace that was once the house of Si Said, the brother of Grand Vizier Abu Bou Ahmed, who finished the construction of the Bahia Palace. 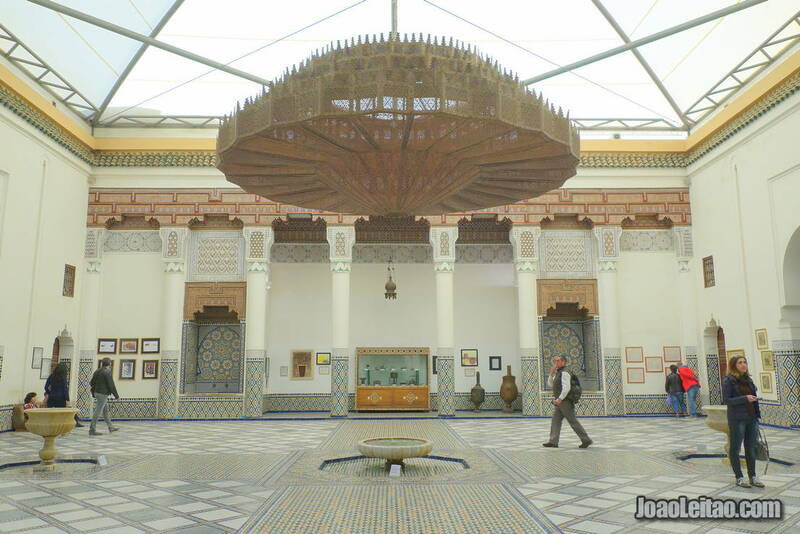 It was the first museum in Marrakesh, and it’s dedicated to folklore and traditional art and trades of the country. 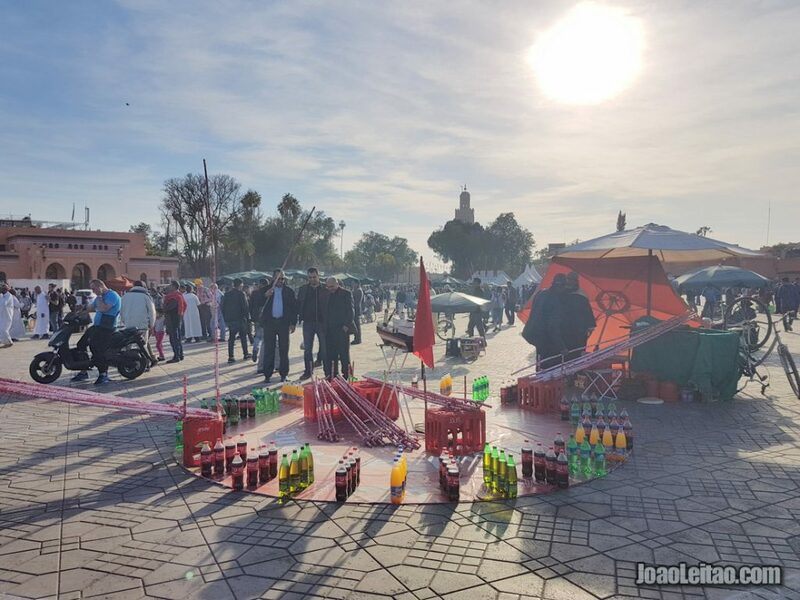 You can now return to Jemaa el-Fna square to experience that wonderful atmosphere once more, relax, and give your feet some rest while having a drink at a historical café. Located close to the southeast corner of the square, Café de France is not traditional, but it’s iconic as one of the oldest cafes in Marrakesh. As you can tell by the name, it’s a French-inspired establishment that resident Europeans and tourists looked for in Marrakesh decades ago. 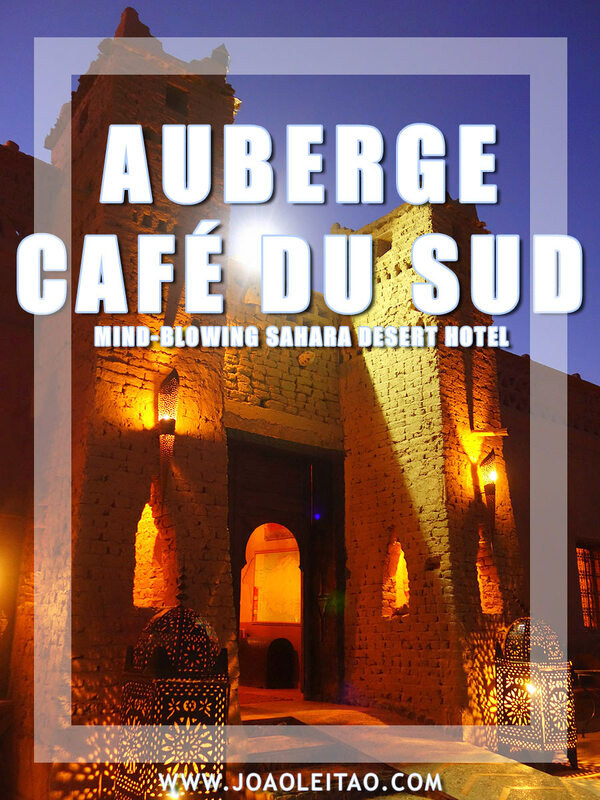 Unlike the typical Moroccan café, it’s spacious, with an esplanade from where you can watch the bustling square. The top deck is a perfect place to see the sunset, but it will be hard to get a table at that time. It’s one of Marrakesh’s reference meeting points because everyone knows the place. Customers are an interesting mix of locals and foreigners. Following this guide for three days in Marrakesh, you’ve been to many areas of the medina already but always on route to other places. 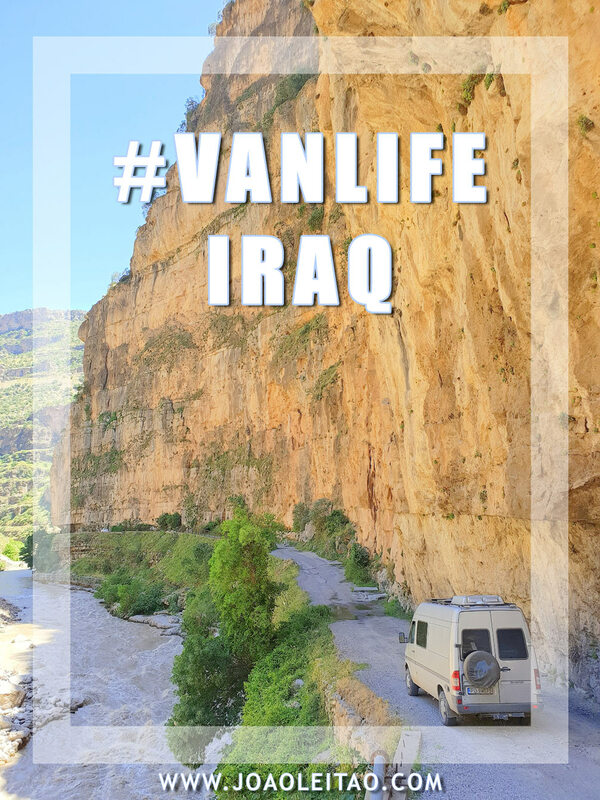 Now if you still have the energy, it’s time to freely wander through its streets and alleys, starting at Derb Dabachi street to the right of the square with the Café de France behind you. It’s an always crowded picturesque street, with fascinating shops and where you can drink delicious milkshakes. It’s a long street so follow along, getting lost in the details, and as far as you feel comfortable. Try to be there at the end of the day when the streets become even more crowded. Enjoy the medina. After all, it’s been listed as a UNESCO World Heritage Site since 1985. 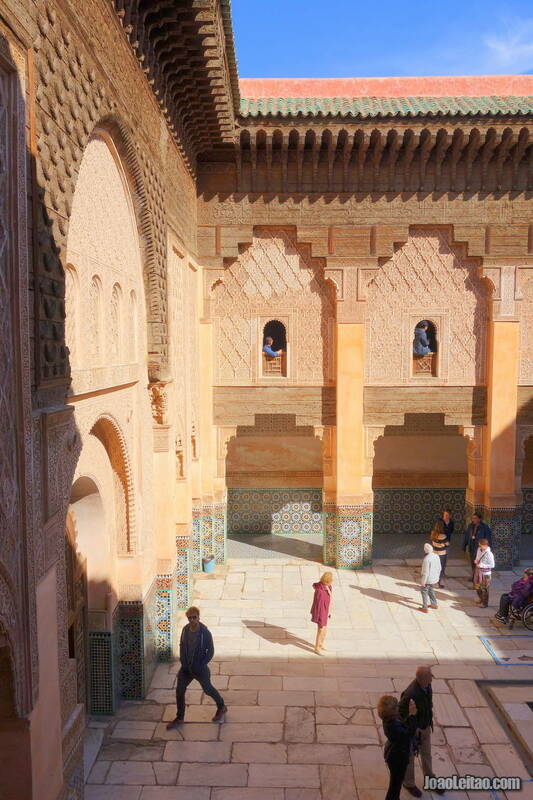 We’ll spend the morning visiting some sites in the heart of the medina, starting with the Ben Youssef Madrasa. This religious school was built in the 14th century and is one of the largest in North Africa. It was named after the Almoravid sultan Ben Youssef, who ruled between 1106 and 1142. The Madrasa was rebuilt in the mid 16th century, prepared to house 900 students in 132 rooms. 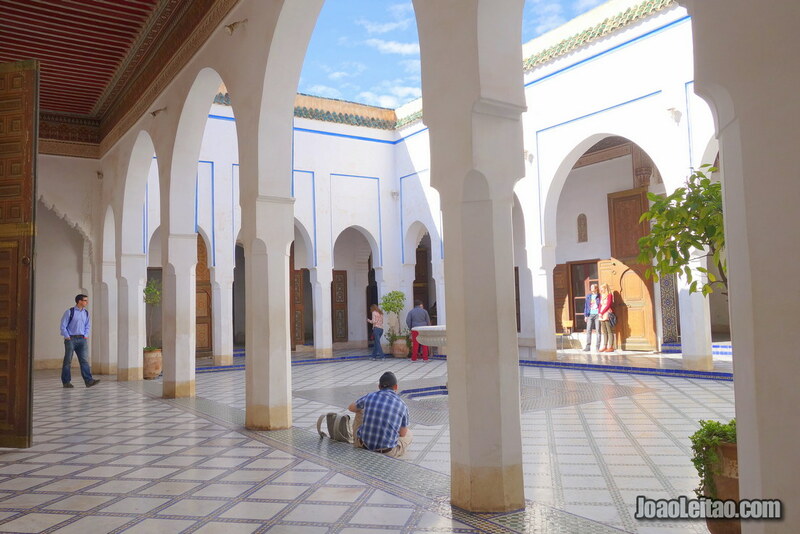 In the 19th century, it lost ground to the competing Bou Inania Madrasa, in Fez, and not even the renovation work saved the school from closing. It was permanently shut down in 1960. Nowadays it’s open to the public every day, and the admission fee costs 50 Dirham. 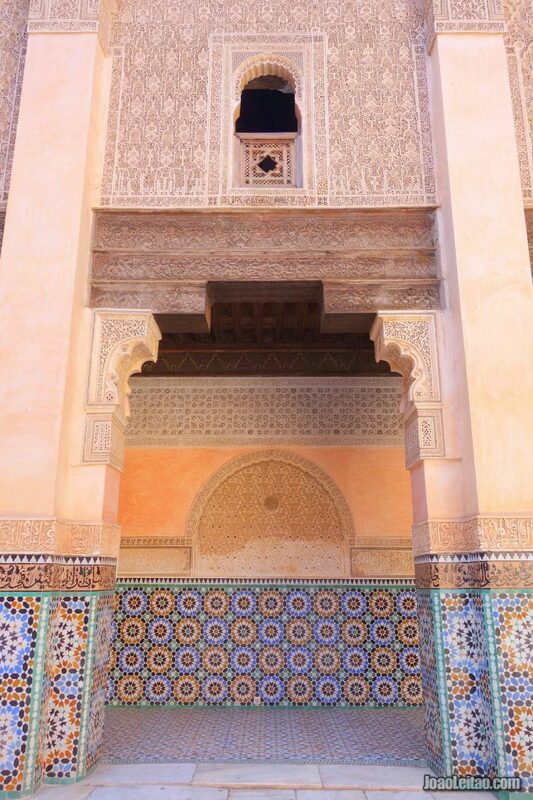 It’s an excellent opportunity to see the best of Marrakesh when it comes to architecture and ornamental art. The Madrasa is linked to the Ben Youssef mosque but, as I mentioned before, in Morocco only the Muslim are allowed inside the mosques. Admission fee is 60 Dirham. 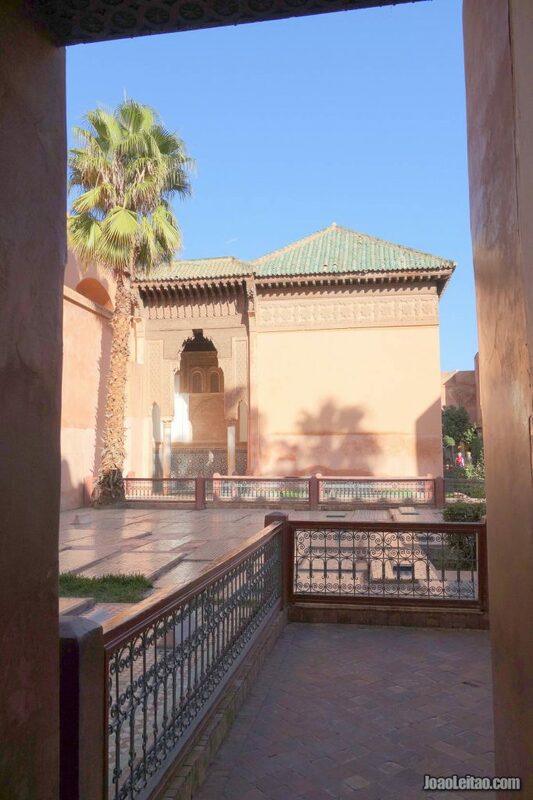 The Marrakesh Museum is located right next to the Madrassa. 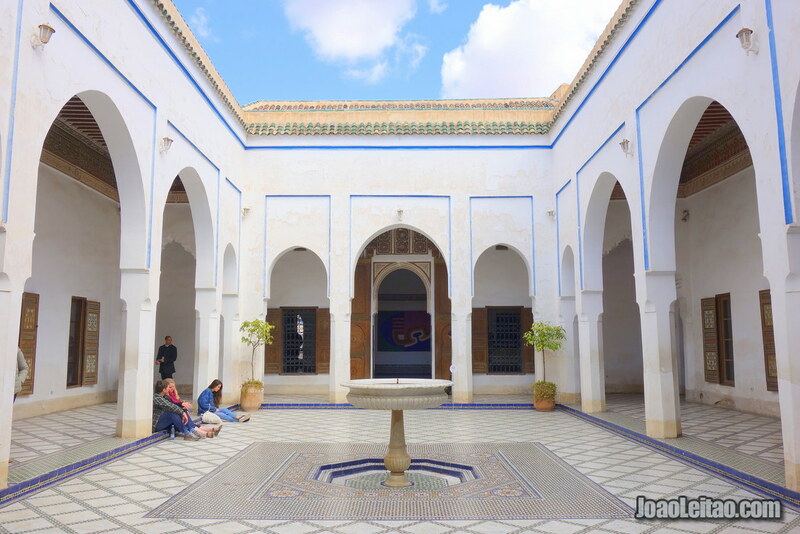 It’s a Moroccan Art and History museum housed in the Mnebhi Palace, the former official residence of Defense Minister Mehdi Mnebhi under the ruling of Sultan Moulay Abdelaziz (1894-1980). After the independence of Morocco, the building was nationalized and converted into a school for girls in 1965, the first one in Marrakesh. The museum opened in 1997, after extensive renovation work, and its typical Andalusian architecture style is almost as impressive as the exhibition. 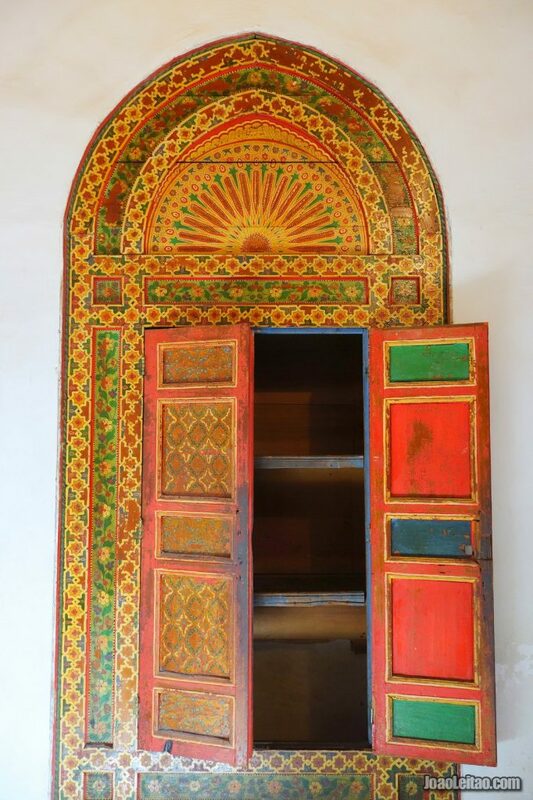 It holds a collection of Moroccan art pieces, historical books, coins, and ceramics. Admission fee is 40 Dirham. When going out of the Madrasa, walk to the end of the street, opposite Jemaa el-Fna square, turn right and walk for about 150 meters until you reach the House of Photography on the left. Some call it Photography Museum but the place is more of a photography exhibition center. It’s housed in a building with several floors, and there are always beautiful photos to see. 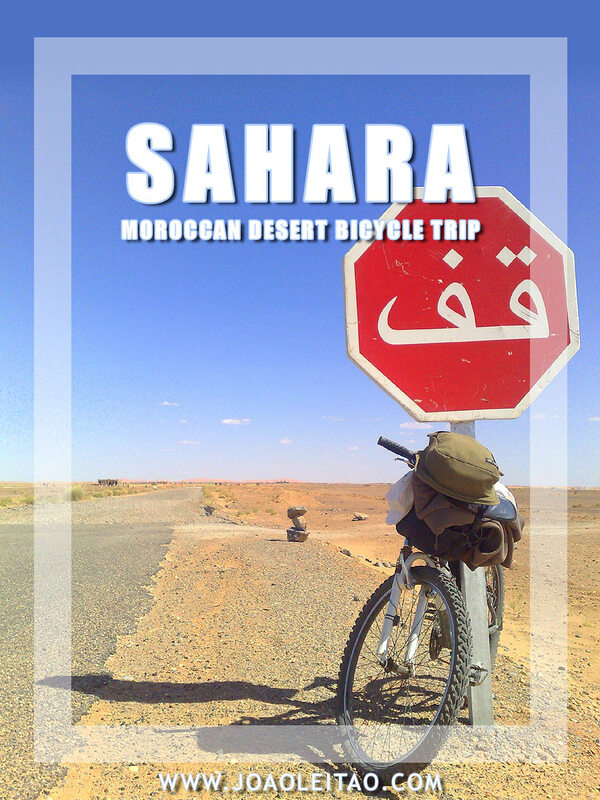 The project was launched in 2009 by the hand of French Patrick Manac’h and Moroccan Hamid Mergani. House of Photography has mostly historical photos and frames from 1870 to 1960. The must-see collections of James Valentine, George Washington Wilson, and Gabriel Vevre, who worked with the Lumière brothers, are on the first floor. On the next floor, you’ll find glass plates from the early 20th century by René Bertrand. Here you’ll also see the work of Marcelin Flandrin, Bernard Rouget, and Garaud who photographed between 1930 and 1950. On the last floor, there’s a mix of different photographers. On the terrace, with a beautiful view to the Atlas Mountains, you can grab a bite and drink tea. When you walk out of the House of Photography, keep walking in the opposite direction. After crossing a busier street, you’ll continue to walk on Avenue Bab El Debbagh. The leather shops are at the end of this street, close to the Bar Debbagh gate. These shops might not be as famous as the ones in Fez, but here you can also see them dyeing the leather. It’s as beautiful to see as it is smelly, not a great visit for the faint of heart. Mornings are the best time of day to visit when workers are busy dyeing. 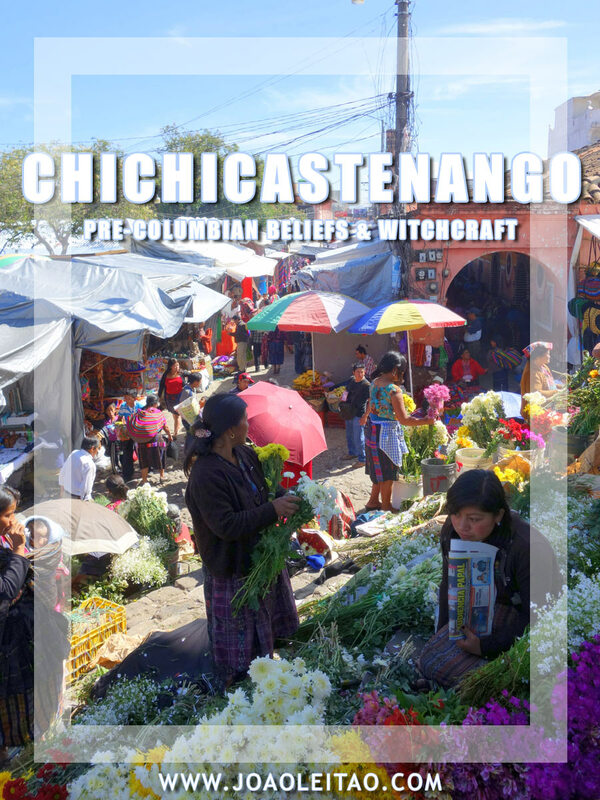 There are several shops, and as you walk down the street, you’ll be invited many times to visit one. 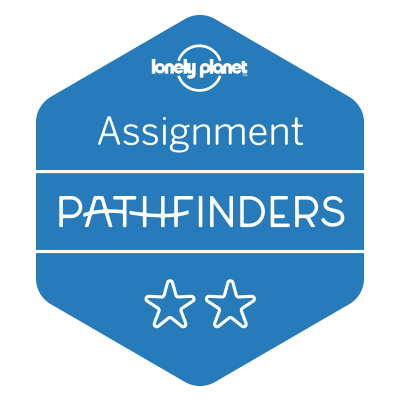 Their goal is to take you to a place from where you have an overview of the shops, except these places are inside the leather shops, and they’ll obviously try to sell you something. If you want, you can try to visit closer to the tubs where the work is happening. The most famous is Dar Dbagh. Ask one of the workmen if you can visit, he’ll gladly show you around, allegedly for free, but in the end, he’ll ask for a fair tip of 100 Dirham. Don’t pay more than 20 Dirham. Go back to the heart of the medina, to the big square, stop for lunch and enjoy the place knowing this will be your last day in Marrakesh. 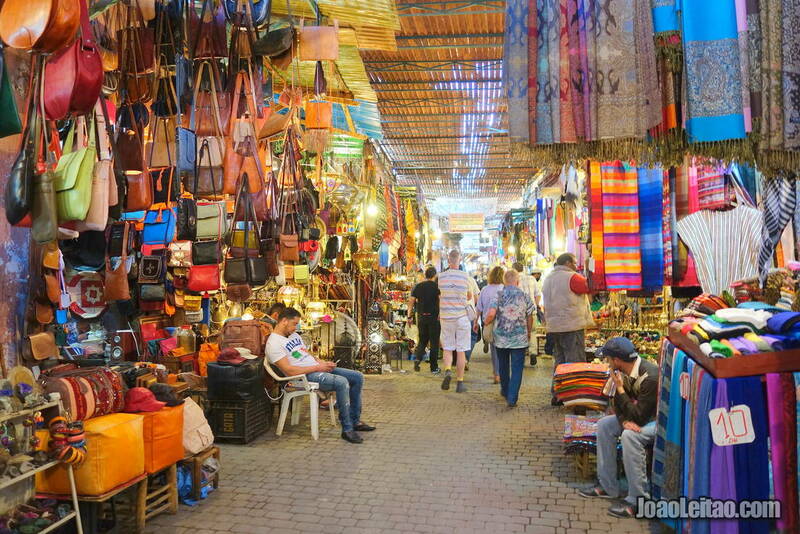 Then, get ready to explore the markets (souks). 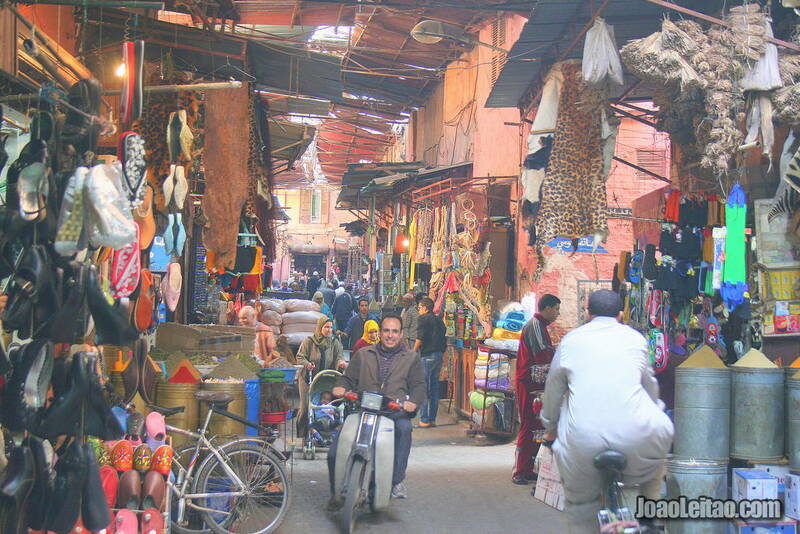 There are several souks scattered throughout the Marrakesh medina, but the biggest and main market is north of the Jemaa el-Fna square. Look for the restaurant Terrasses de l’Alhambra and get inside the El Bahia souk through an alley close by. From there, you can explore smaller markets in the area. 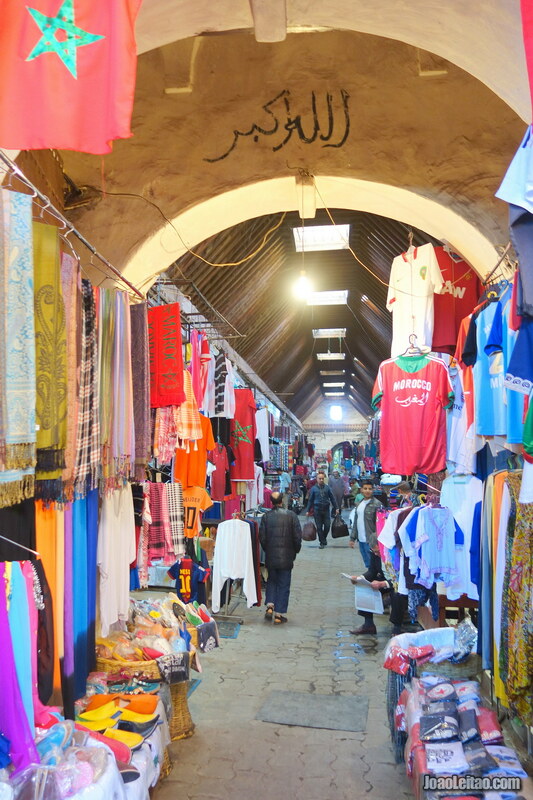 Try starting your tour of the souks at around 4 p.m. and get lost in the corridors and alleyways. 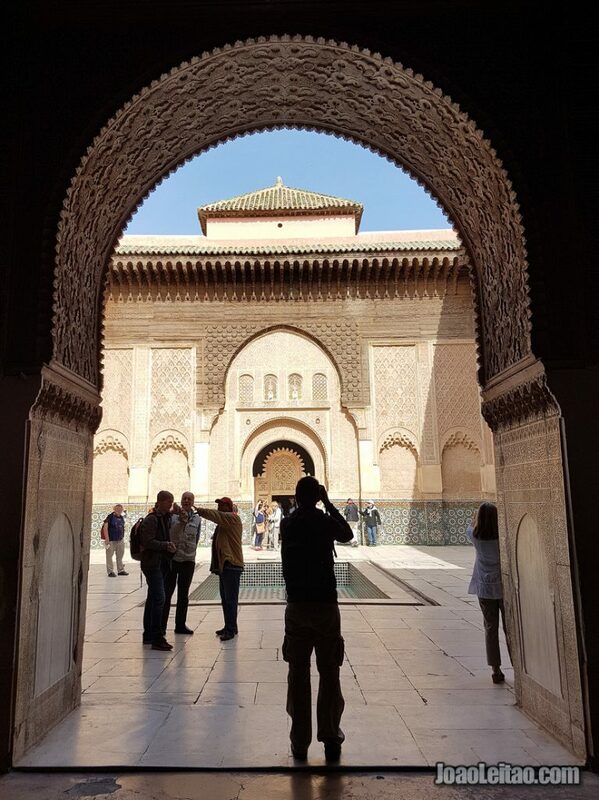 If you have any energy left on your last day, visit the Saadian Tombs in the south of the medina, a little before the mellah. 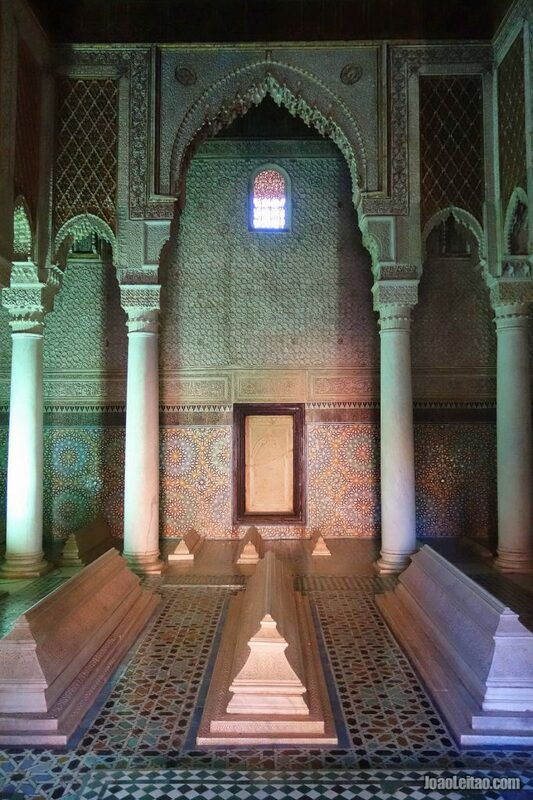 These tombs go back to the Saadian Dynasty when Ahmad Al Mansur was the sultan (1578-1603). This location was secluded until in 1917 when it was discovered on a photographic recon of the city made by the French from the air. 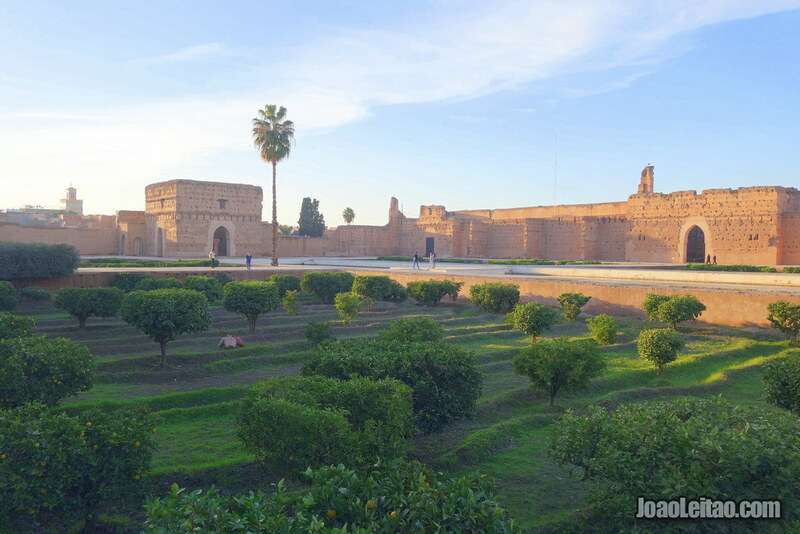 The tombs were part of the El Badi Palace, right next to it, that was later vandalized and taken apart after Moulay Ismail took over Marrakesh. However, the fear of desecrating the grounds kept the tombs safe and merely sealed at the time. There are two mausoleums with 24 tombs, including the one of Ahmad Al Mansur himself. The first one is the most recent and the most beautiful one of the two. The ornaments are quite impressive, reminding us of Alhambra, and worth the visit. The tombs were built with marble imported from Italy and they have beautiful stucco work made with cedar wood. 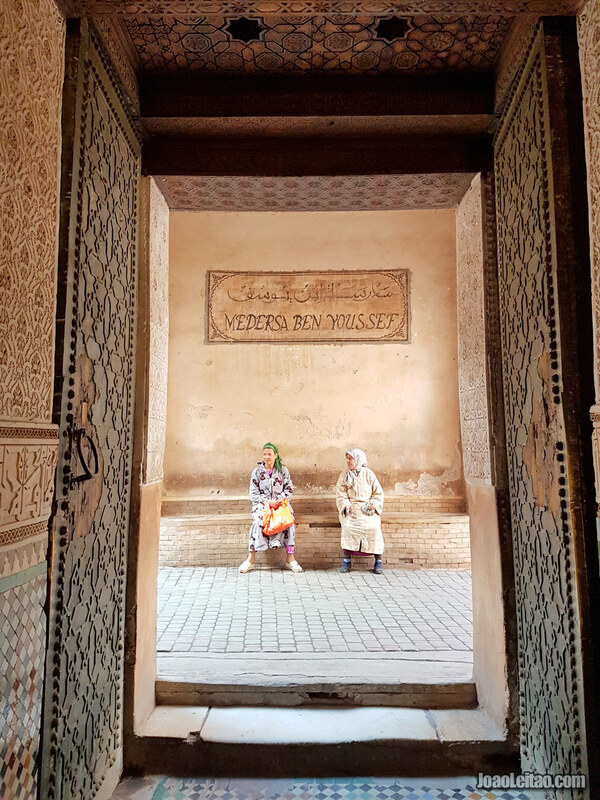 If you visit the Saadian Tombs, make sure you visit Bab Agnaou if you haven’t yet by then. It’s probably the most beautiful gateway to the old city, and it’s right next to the tombs. 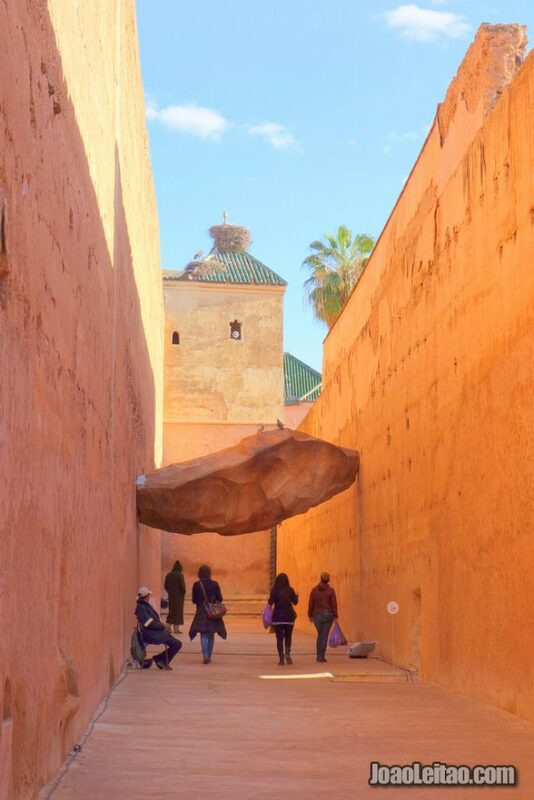 It was built in the 12th century, with a stone that had a blueish hue in the beginning but that the desert sands turned into the reddish color you’ll see now, and that’s not much different from the primary color you see around Marrakesh. Although it was never the main entrance gate into the medina, it was the monarch’s entrance, and that’s why it’s especially ornate. It’s a shell-shaped décor, with floral motifs carved in stone. 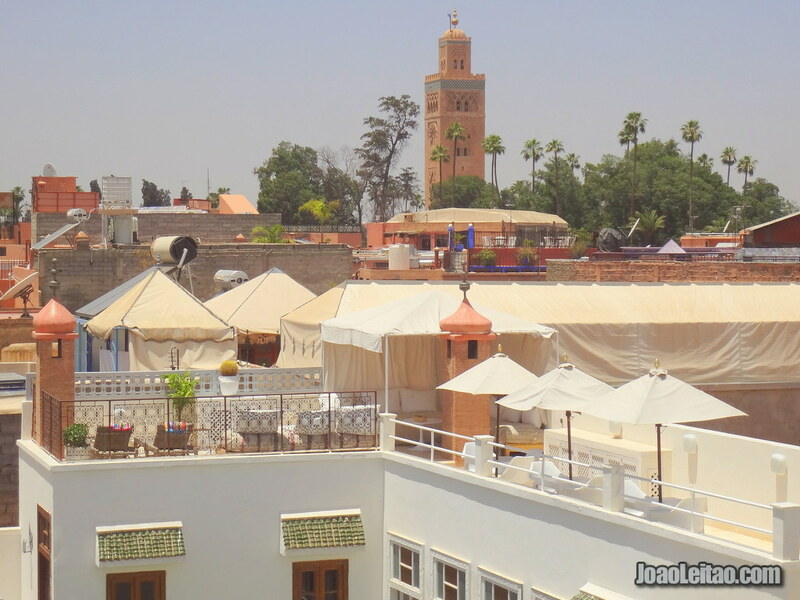 Marrakesh follows the trend of most Moroccan cities: the big international chain hotels are located outside the historic center. It’s a common situation because there wouldn’t be enough space to build this kind of accommodation in the medina. On the other hand, the more traditional houses with a local feel, and some of them extremely comfortable are located within the city walls. For travelers on a shoestring budget looking for a hostel-type of accommodation, there’s the Majorelle Hostel where you can stay in a dorm room for 5 Euros. The hostel is built in a riad, is very close to the Jemaa el-Fna square, and it’s one of the best in the city. Selection of the cheapest riads in Marrakesh taking into account the reviews of previous clients. 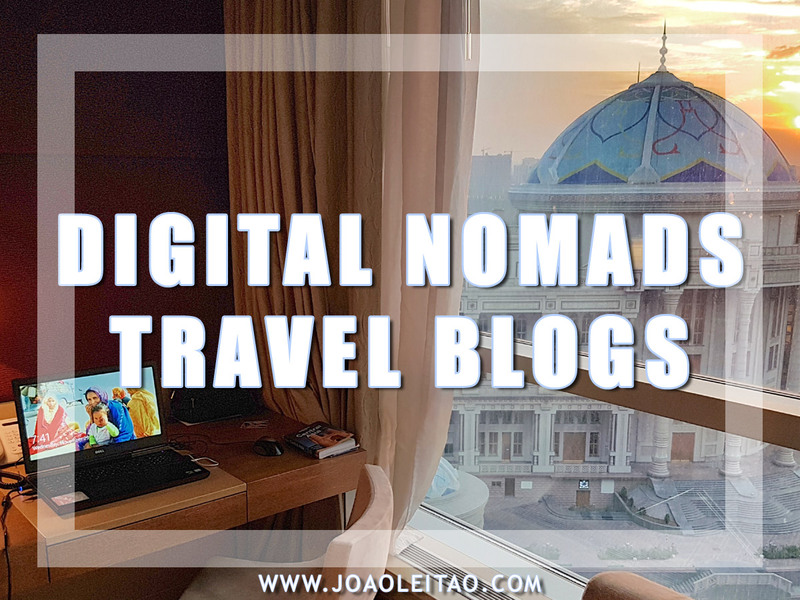 All the riads on this list are located in the heart of the medina, have breakfast included and free Wi-Fi internet. Several airlines frequently fly to Marrakesh. For example, Easyjet and Ryanair operate several routes from all over Europe with cheap tickets. The international airport is close to the city center, about 5 km away, with several transportation options. There are frequent bus connections between Marrakesh airport and the city center. Bus number 19 has one of the most convenient routes, going by the city’s leading hotels and ending close to the famous Jemaa el-Fna square. There are no fixed stops so ask the driver to stop when you want to hop off. Tickets cost 30 Dirham (around 3 Euros), and there are buses every half hour between 6:15 a.m. and 9:30 p.m. Off those hours, look for bus 11 (see below how to find the stop) or take a taxi. One last option is to risk walking to the city center. It’s about a 30-minute walk, but usually, you get there in less time. It’s easy to find bus 19 stop: go out from the arrival area in terminal 2, turn left, and pass by the parked taxis until you reach the bus stop. If you’re planning to return home in less than two weeks, you can buy a return ticket for 50 Dirham. For adventurous travelers, choose bus 11. This bus stops outside the airport compound and finding the stop is challenging. At the airport, you’ll be lucky to find someone who can tell you how. 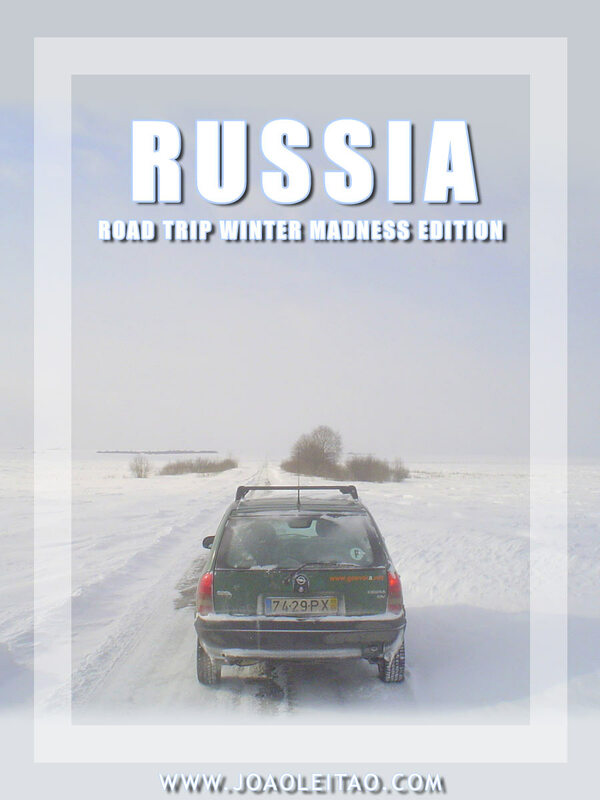 Here’s a way to do it: cross the parking lot, slightly slanting to the right following the car exit. Turn left and walk for about 200 meters until you find a roundabout. Turn left, and after 50 meters, cross the street on the zebra crossing. Keep walking until you see a building with pillars about 75 meters away. The bus will stop somewhere around here. 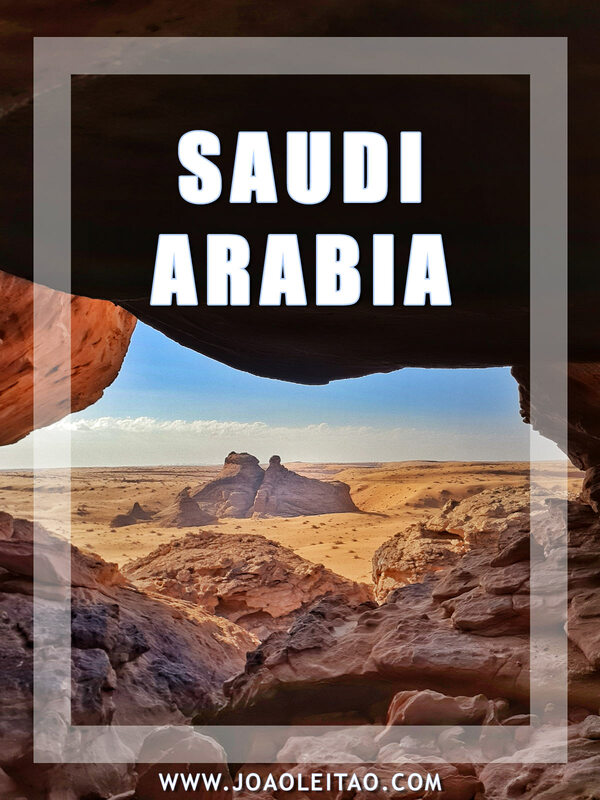 If you speak French or Arab, this is a more valuable option for a few reasons: it’s more fun and appealing; the ticket costs 4 Dirham; it has more extended hours, between 5:40 a.m. and 9:40 p.m. (a little later than that on this spot). Beware that there isn’t much room on bus 11 for large luggage and you shouldn’t pay with large bills. 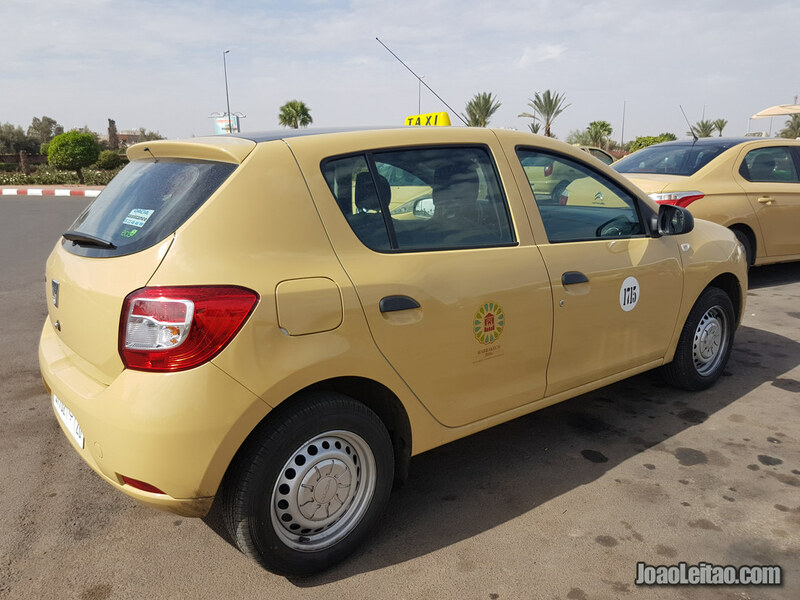 Dealing with taxi drivers in Marrakesh, especially at the airport, will test your patience. According to the meter, a fair price for a ride between the airport and the city center should be around 15 Dirham. But the official rate is of 60 Dirham. Not pleased with this fare, many taxi drivers try to charge passengers even more. You should never pay more than 60 Dirham for a taxi ride between the airport and Marrakesh city center. If you need to catch a taxi and want to save some money, walk until you reach the roundabout and hail a cab there. It will cost you a third of the price, about 15 or 20 Dirham. Unlike what happens with most airports around the world (the Lisbon one is also a good exception), it’s possible to walk from the terminal to the city center. There’s a pedestrian walk that connects the airport to the city, and it’s an easy and safe route, especially in the daytime. It’s about a 5 km walk that you can do while keeping your eyes on the Koutoubia minaret, that works like a beacon for walkers. 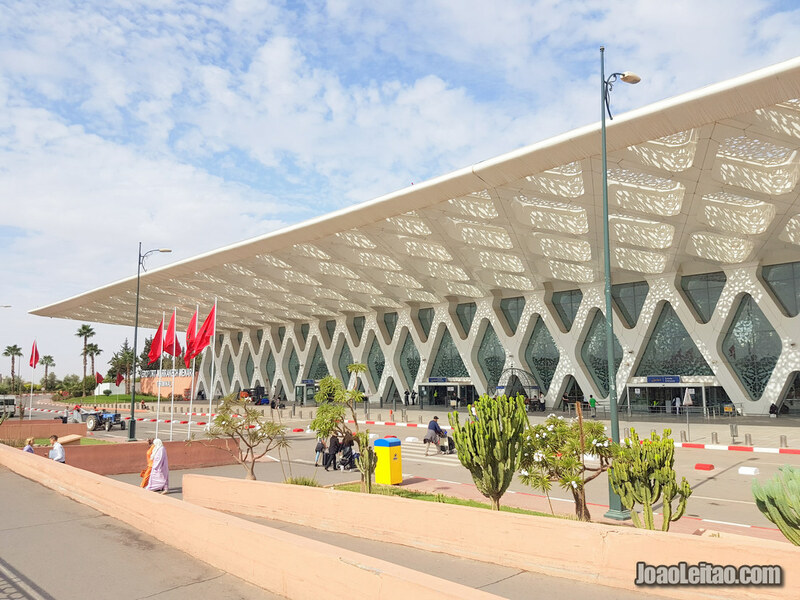 The beautiful Marrakesh train station is located in the Guéliz neighborhood, up the Hassan II avenue. It’s a modern-built platform, prepared to cater to all the traveler’s needs. 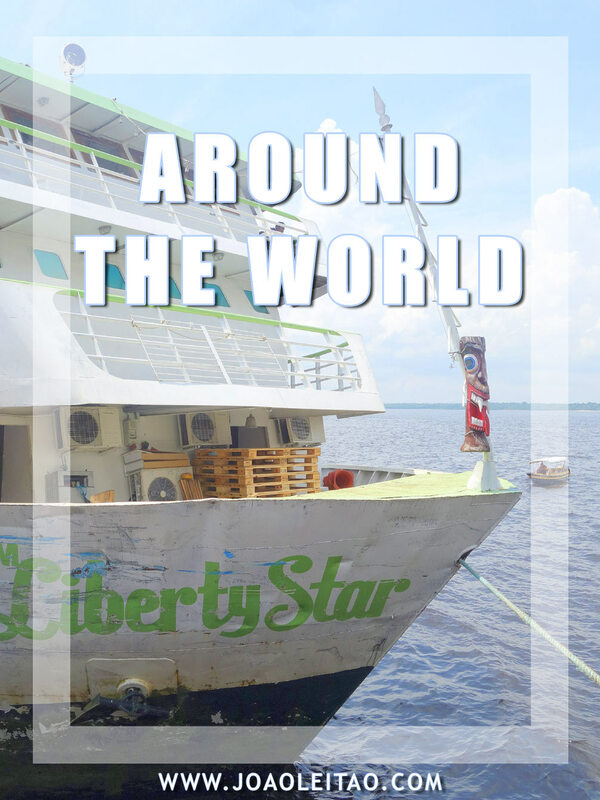 It’s equipped with a tourist office, ATMs, small supermarkets and restaurants, and a store where you can buy local SIM cards. 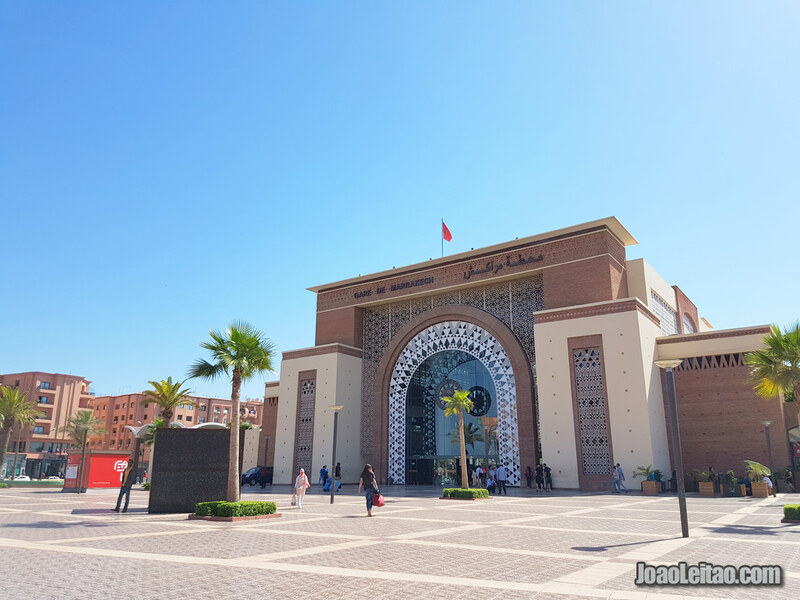 There are train connections from Casablanca (including from its international airport), Tangier, Rabat, or Fez. You can walk from the train station to the city center. It’s about 1.70 km from the station to the walls of the medina. Buses number 3 and number 8 go there. Practically the whole country is connected to Marrakesh by an extensive network of buses from different companies. CTM and Supratours are the best and most popular companies for foreign tourists, and Pullman du Sur can also be a good option. Supratours has its station behind the train platform and has a store and office inside the train station. CTM uses the main bus terminal next to the medina’s west walls.